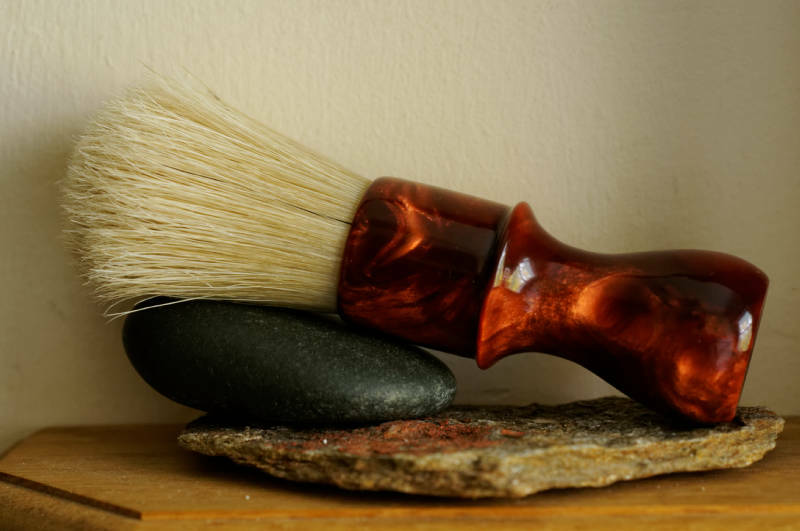 Just finished a custom brush. 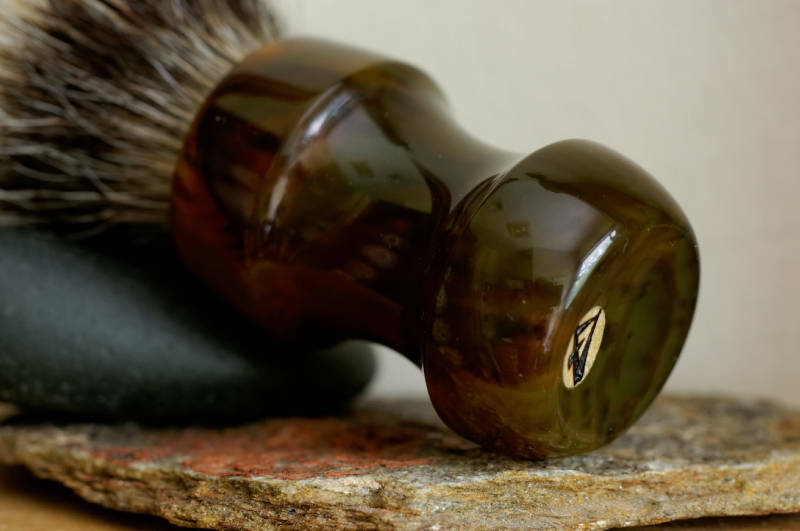 Ever-Ready 100 shape with a center bead. 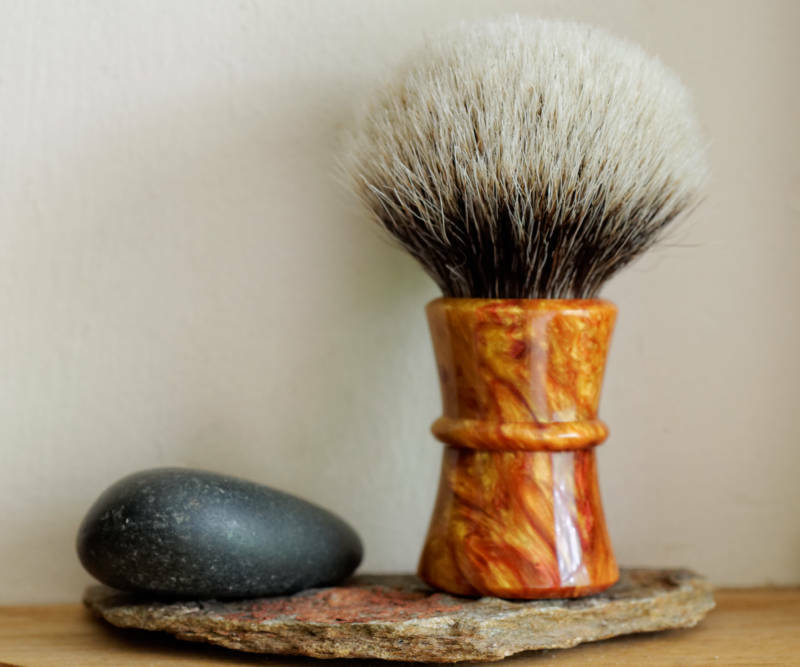 Russet Gold resin, two band finest badger knot. 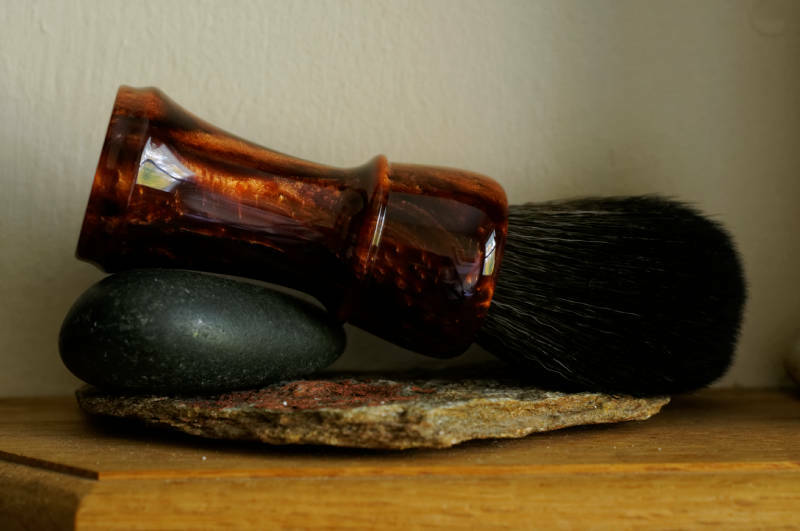 I bought some Faux Tortoise Shell stock and have created my first brush with it. 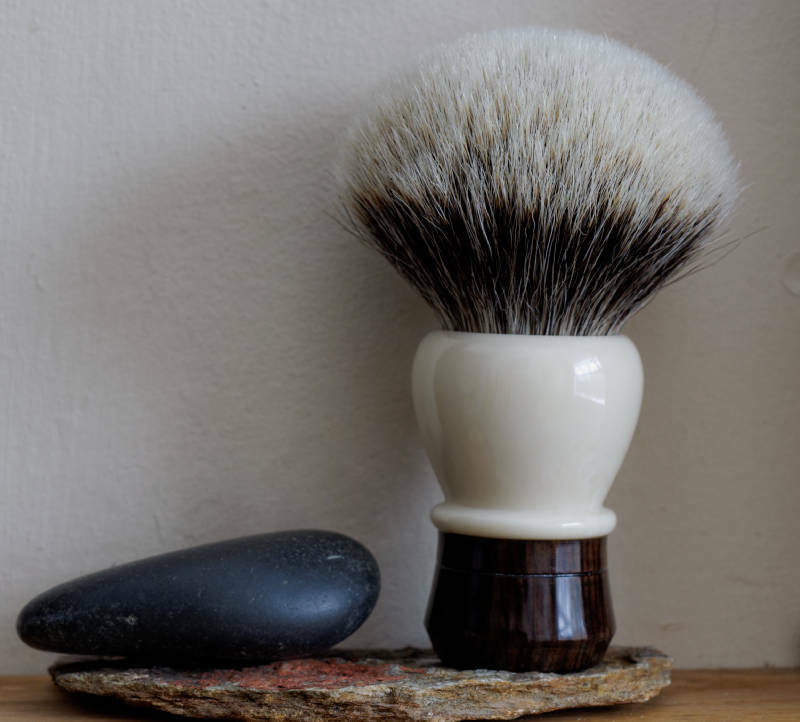 Two band finest badger knot. 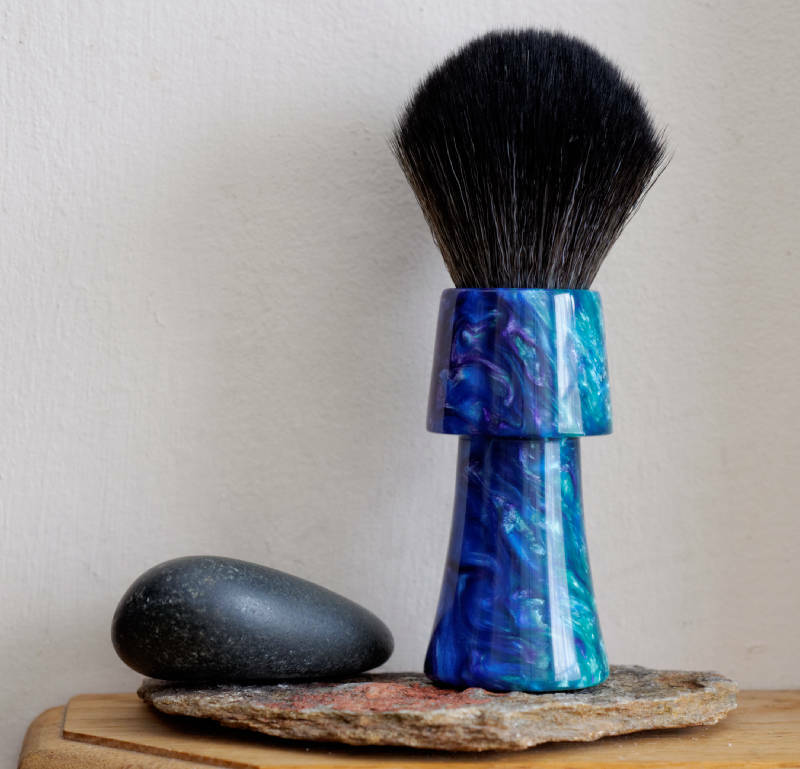 I have completed two brushes for a custom order. 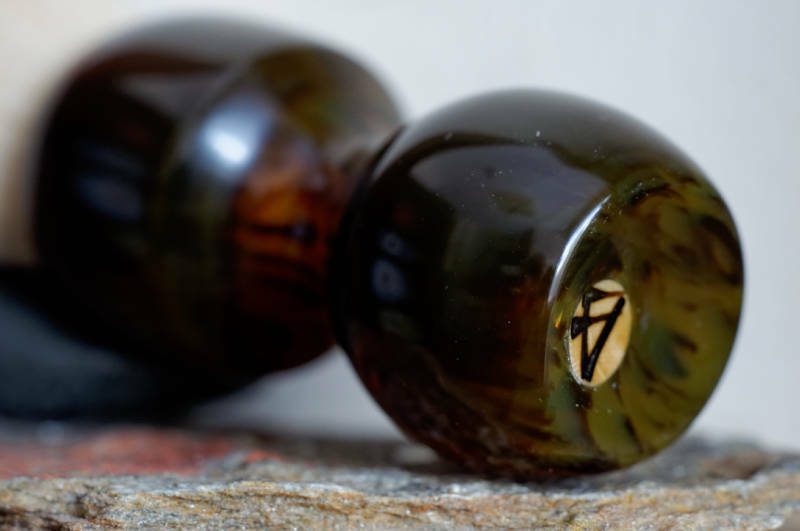 First one is in Bronze Pearl resin and Black synthetic "Game changer" knot. 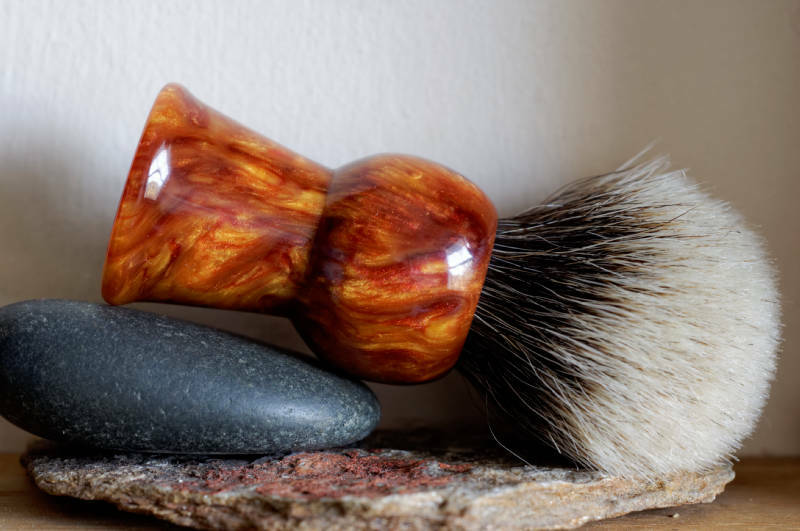 Second one is in Copper Pearl resin and Omega 49 Pro knot. 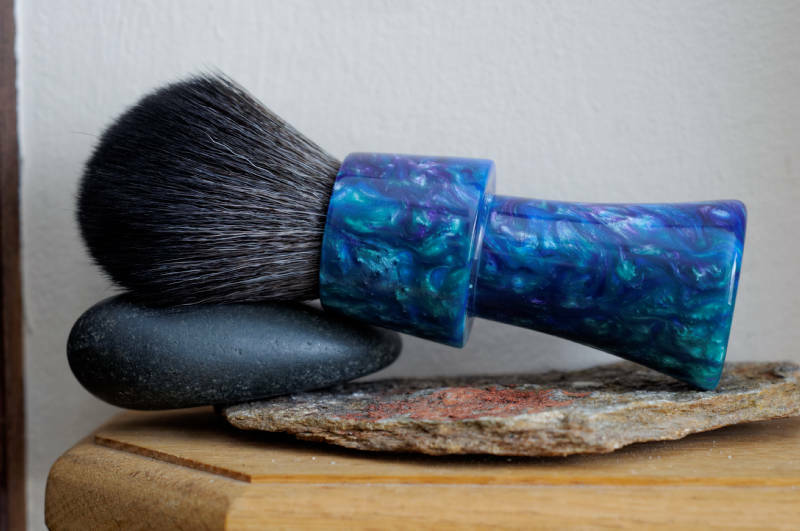 I have completed a new brush for my Etsy Shop. 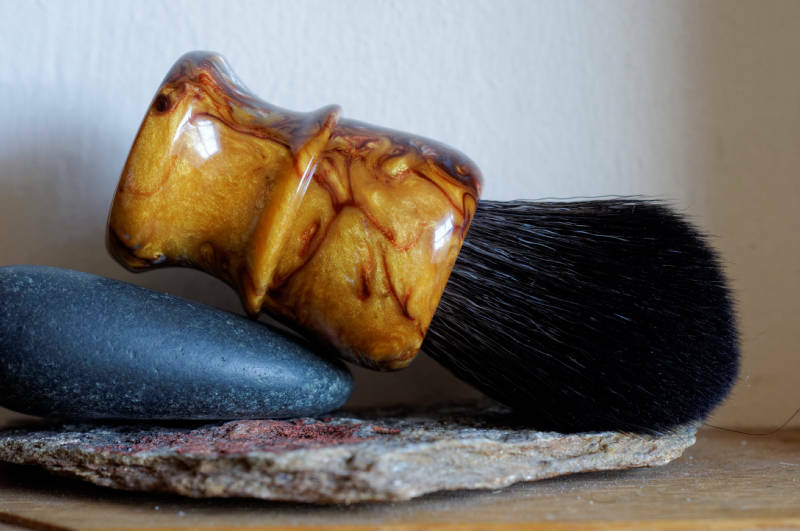 this one is made with Russet and Gold resin handle and a two band badger knot. 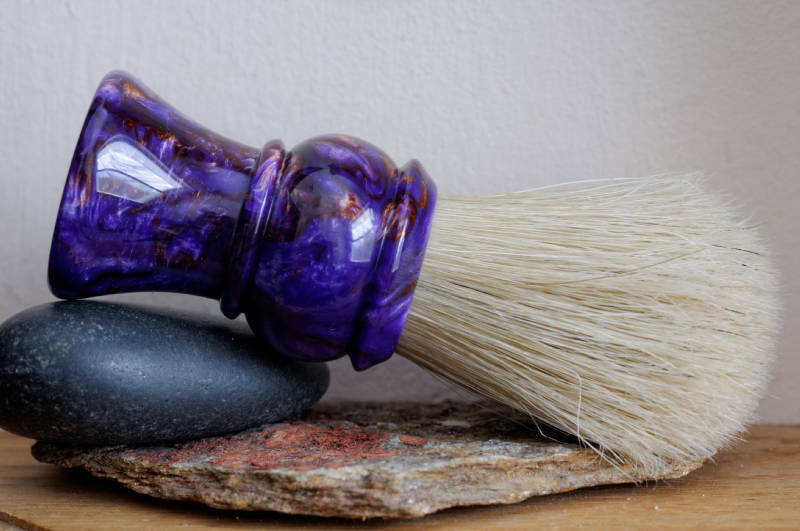 I have just taken delivery of a batch of synthetic knots directly from manufacturer. 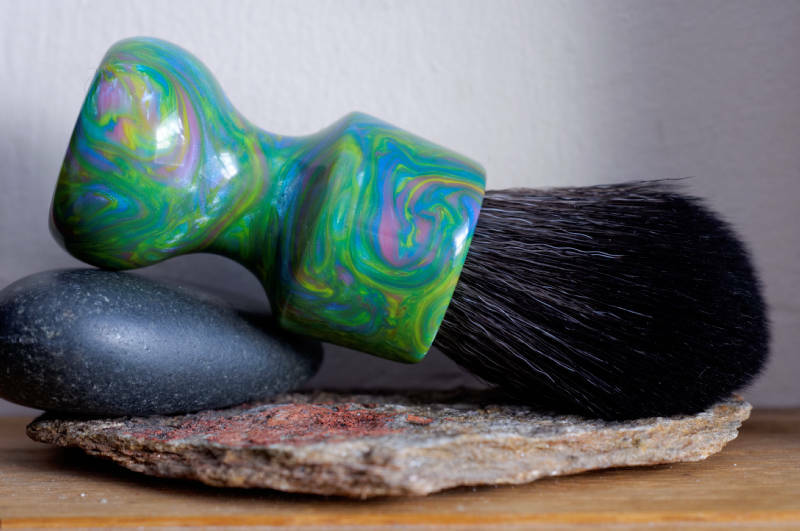 These are the best synthetic knots I have ever tried. 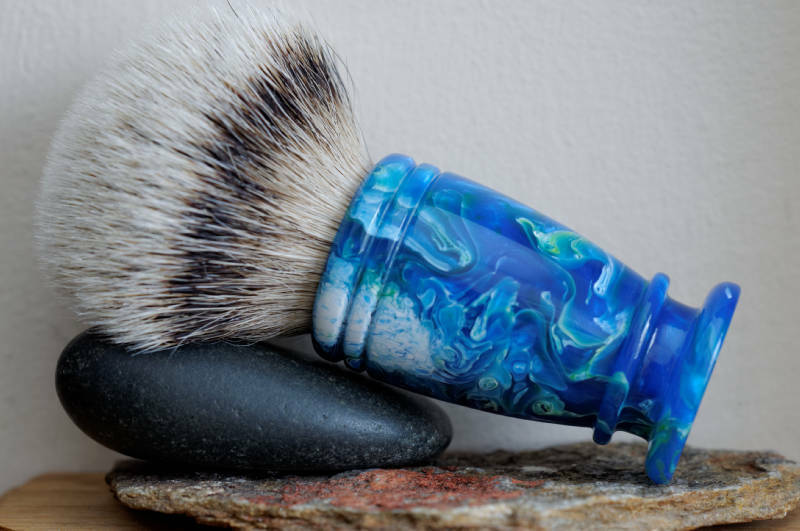 I was never a big synthetic fan until I tried one of these. 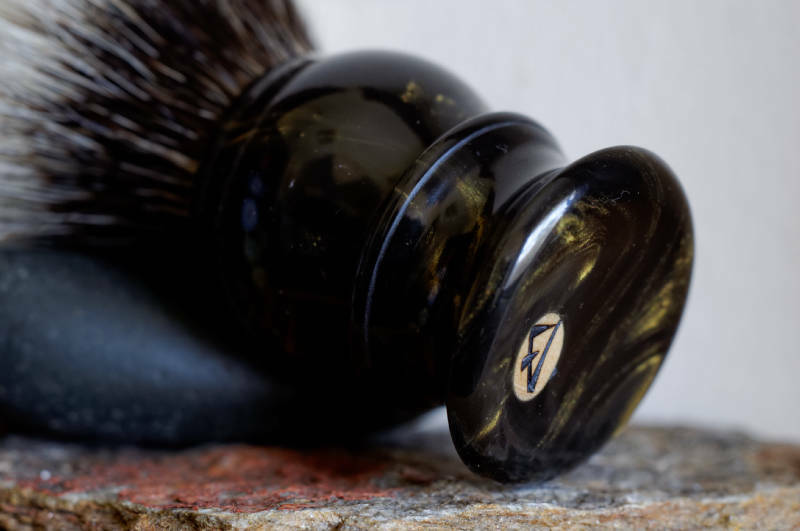 Some call it "the game changer", I and a few fellow brush makers that shared in the purchase of these with me decided to call it Black Onyx Soft Synthetic or BOSS knot. 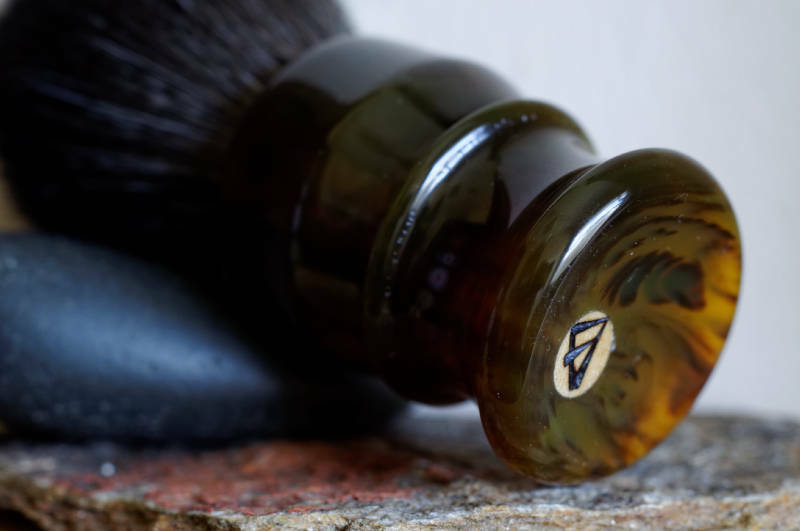 It is 24mm at the puck, which makes a 25mm-26mm brush and is all black in color. 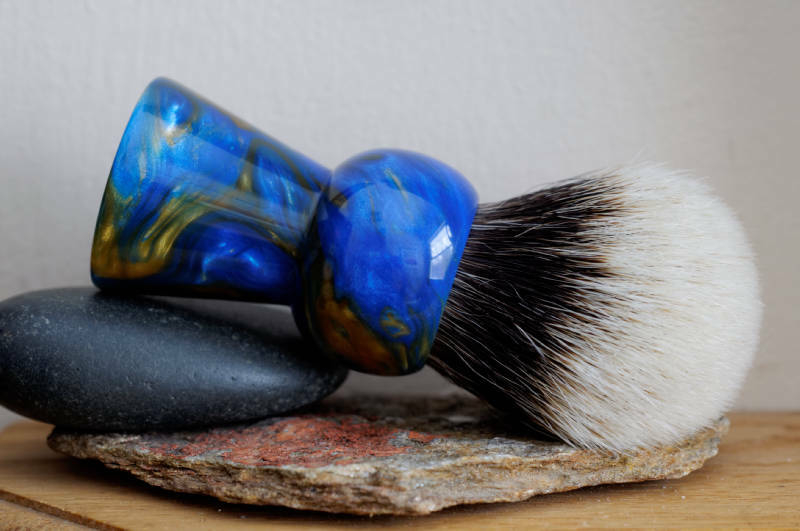 The tips are incredibly soft and the most amazing thing about it is the backbone. 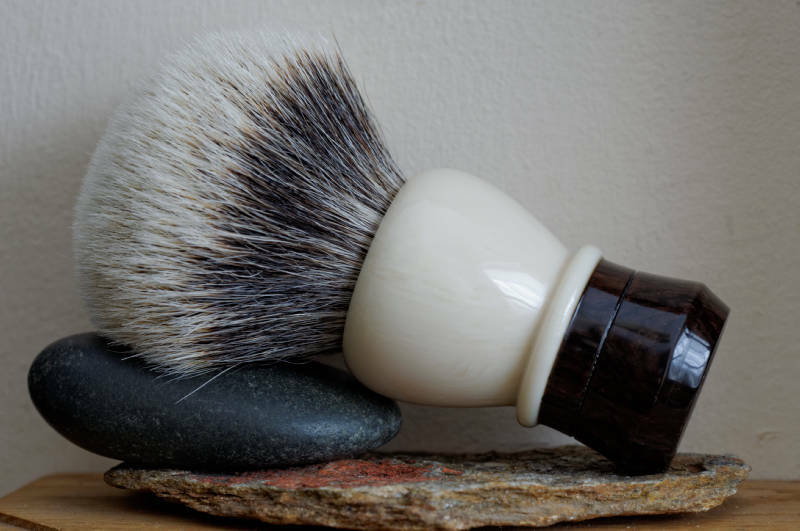 This thing performs as well as some of the best two band badgers I have tried. 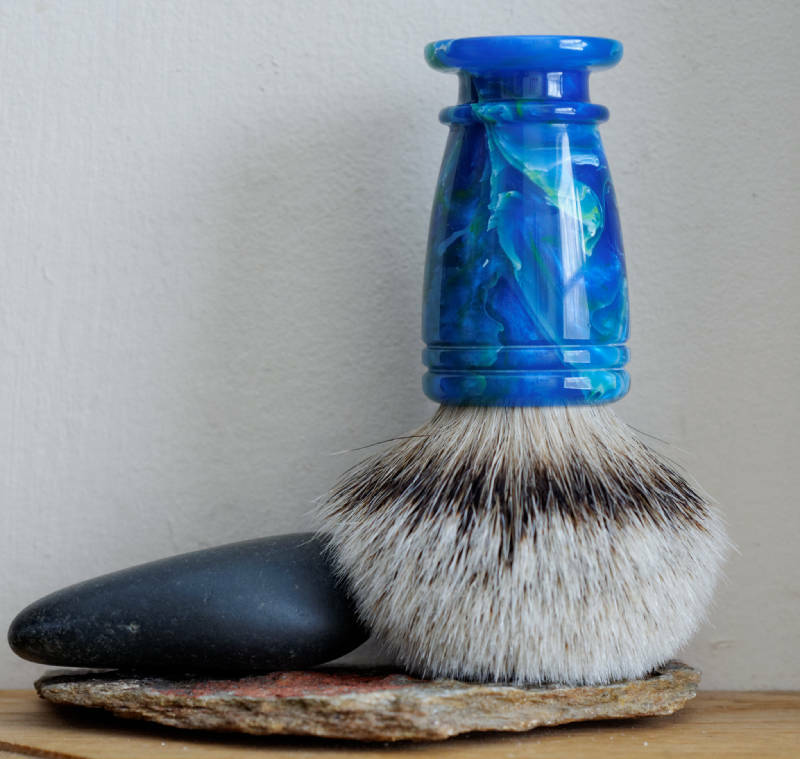 It's quite unbelievable. 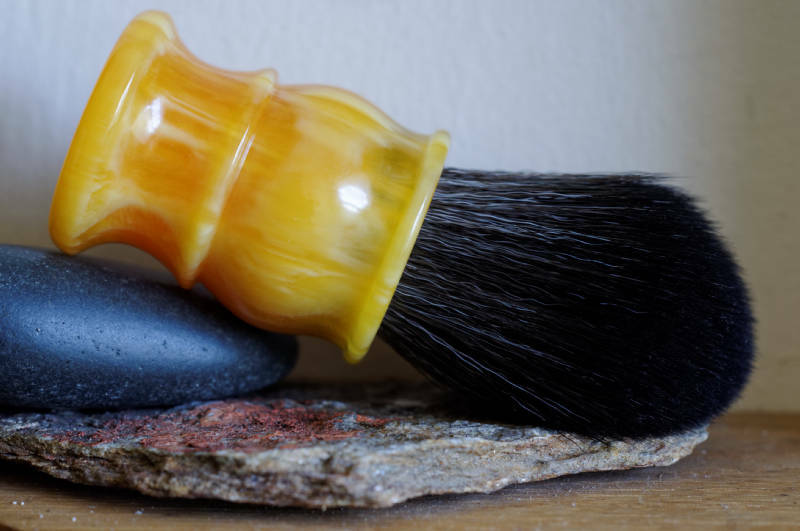 So, without further ado I introduce my newest batch of brushes made with this knot. 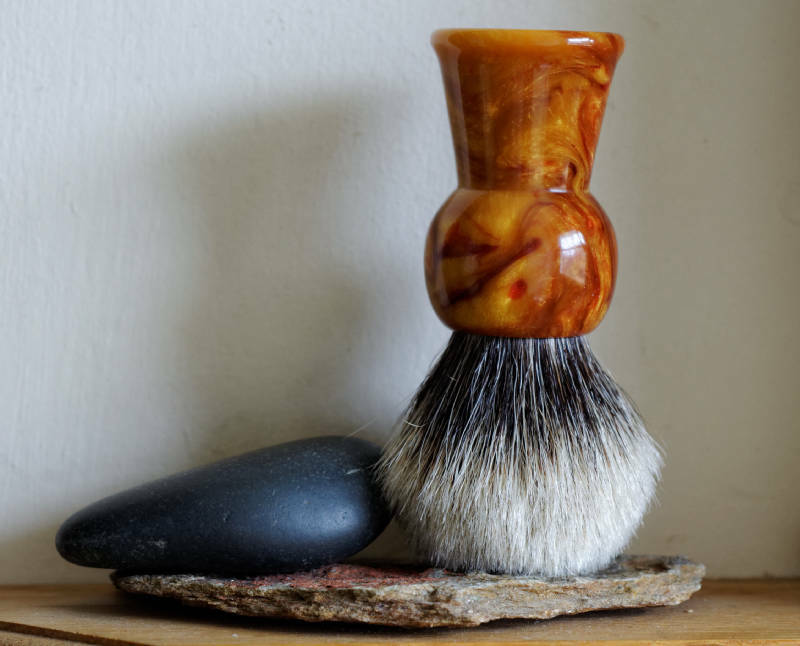 I have also acquired some very nice faux tortoise shell stock and am very happy to combine that with the BOSS knot. 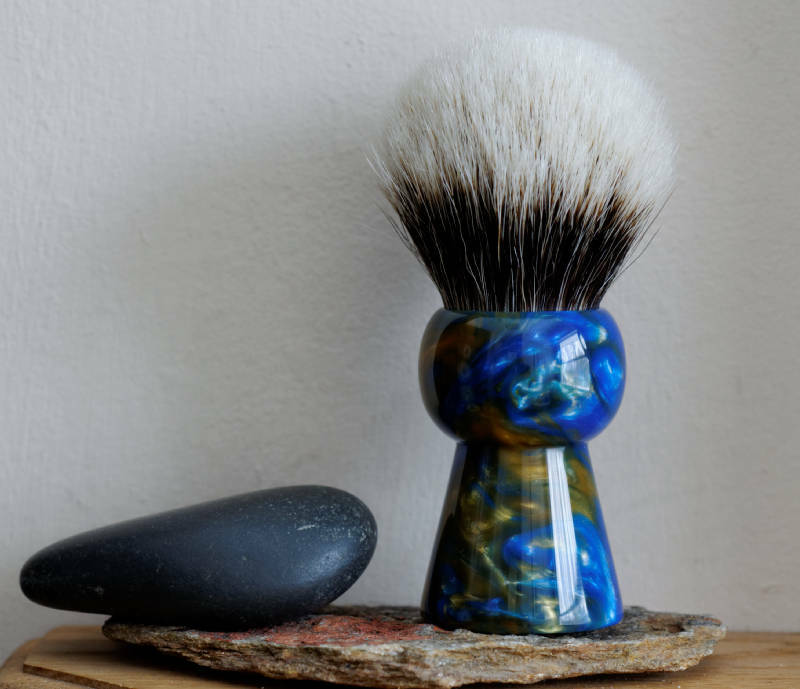 I think they look gorgeous together in an understated way. 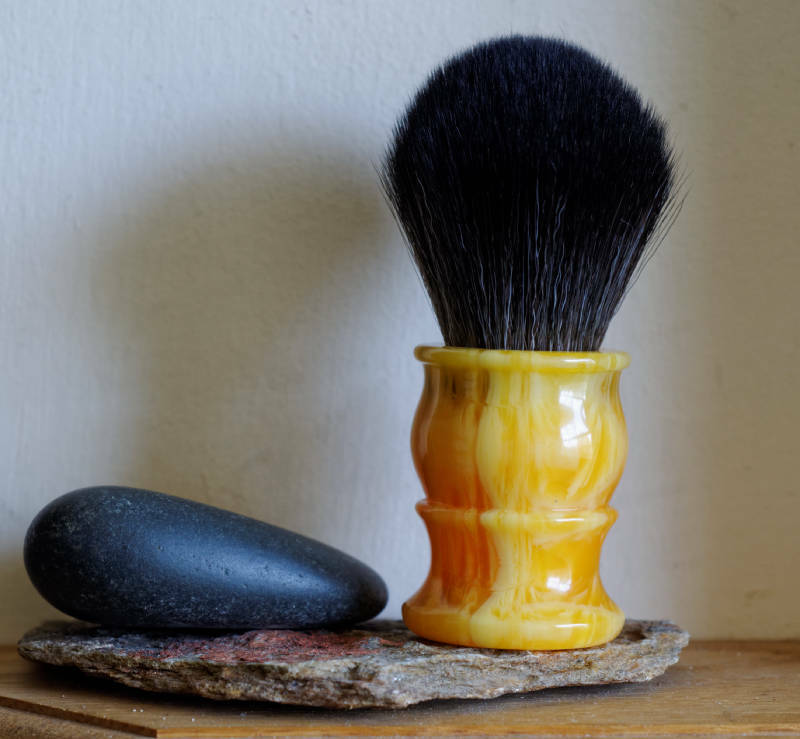 First brush available in my Etsy store. 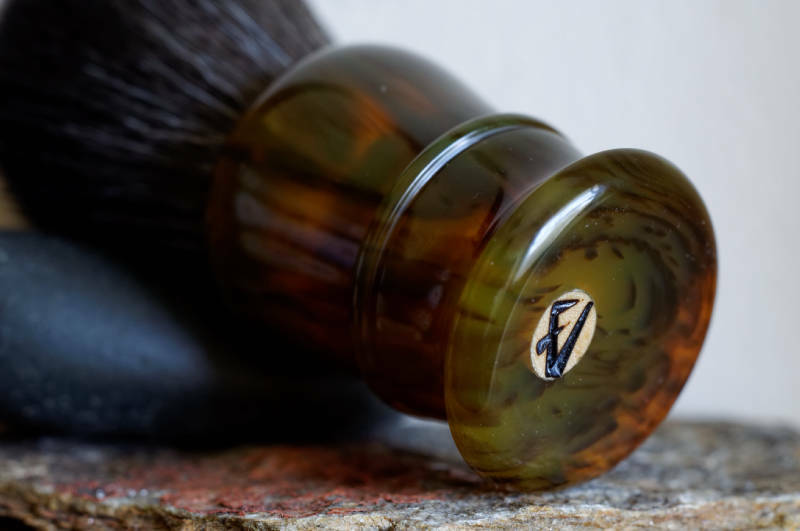 Faux Tortoise Shell resin and BOSS knot. 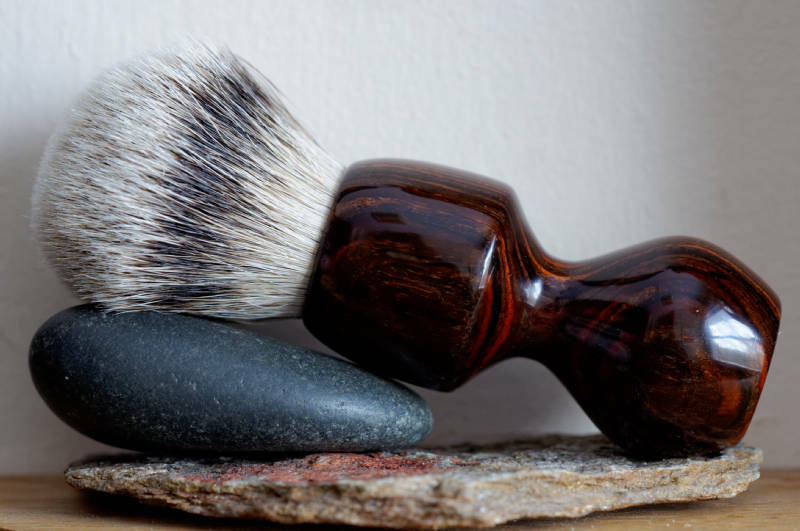 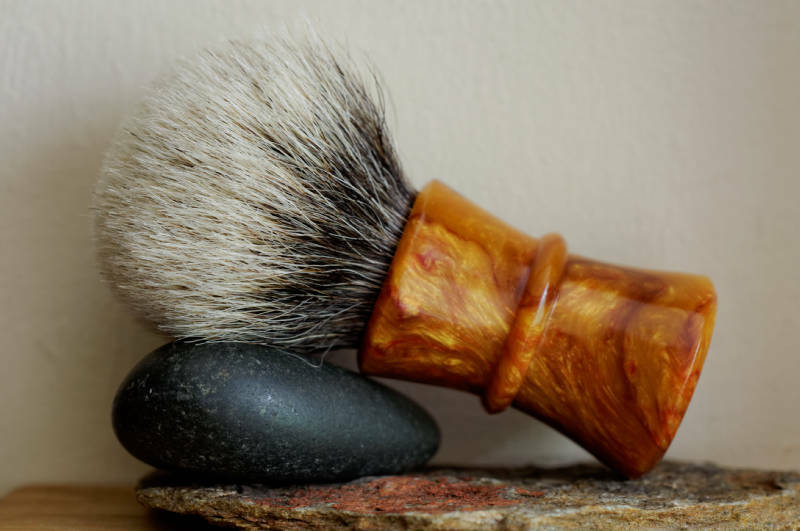 Another Faux Tortoise Shell and BOSS knot brush. 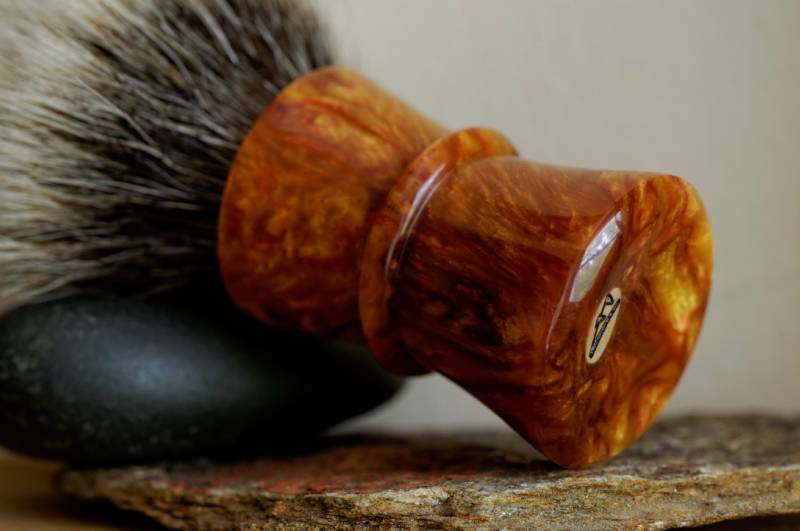 And yet another Faux Tortoise Shell with BOSS knot. 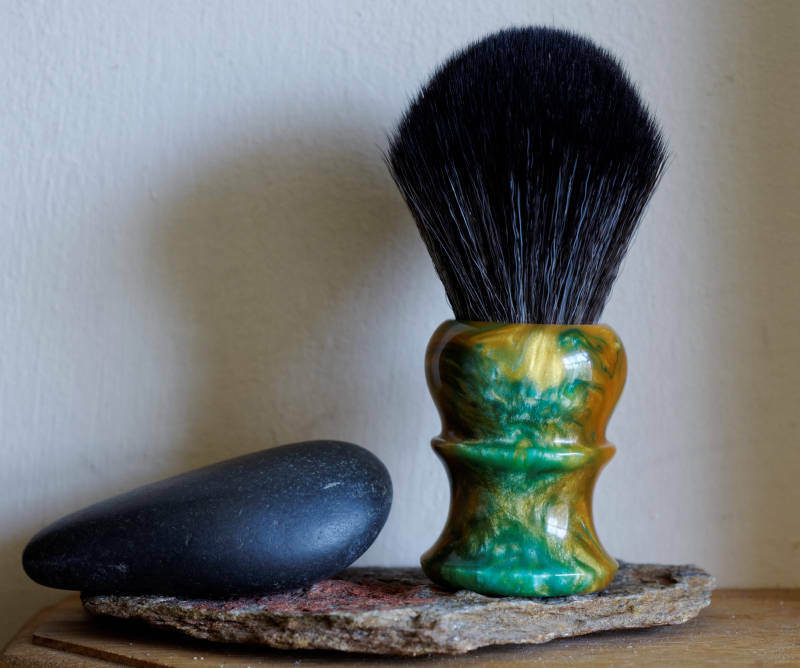 Next brush with the BOSS knot is made with Green and Gold resin. 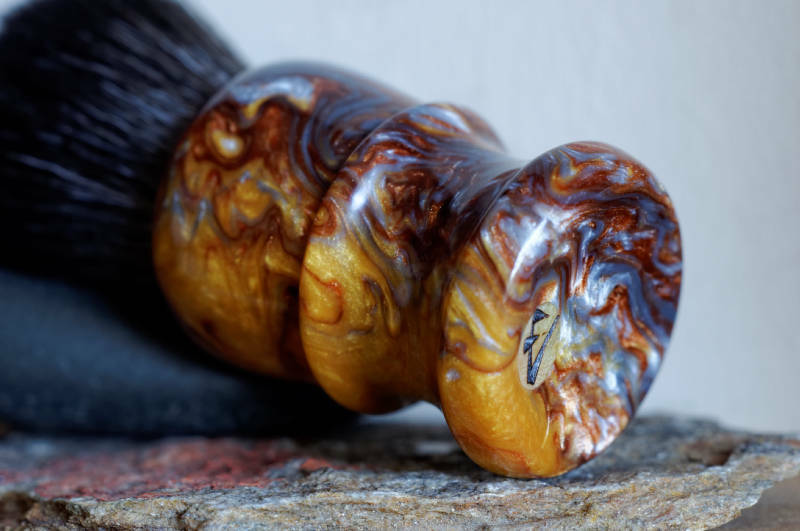 This one is made with Butterscotch resin and the BOSS knot. 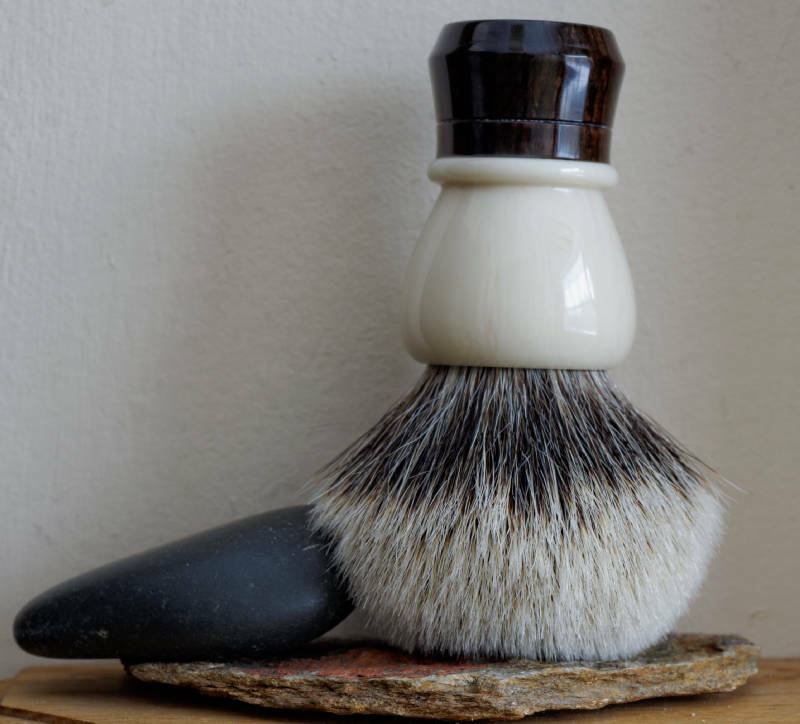 Now back to my beloved two band finest badger. 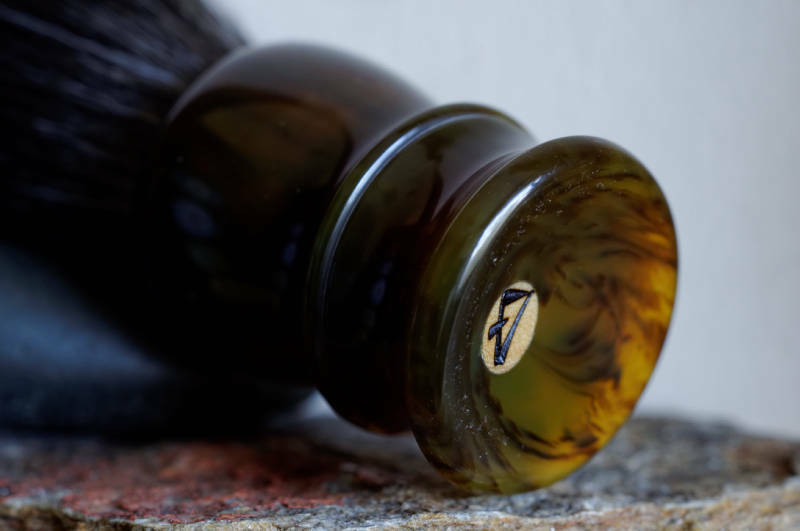 This brush is made with resin material called Golden Black and I think it is absolutely stunning in person. 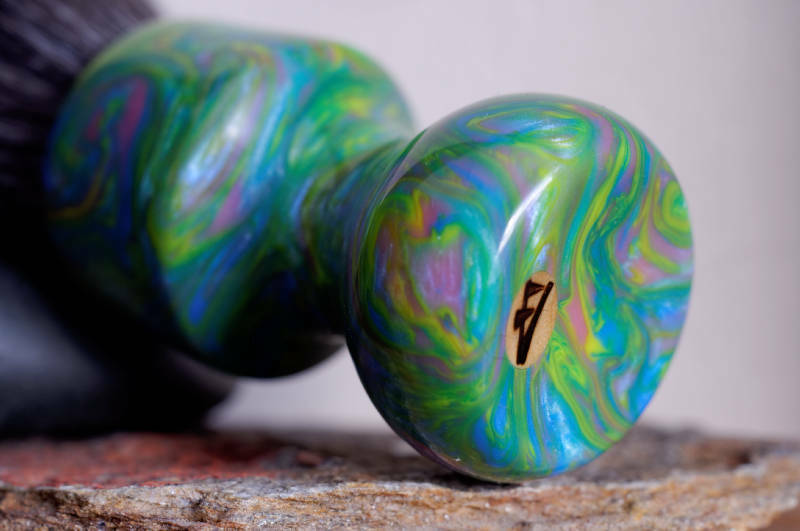 As always, the photos just don't do it justice. 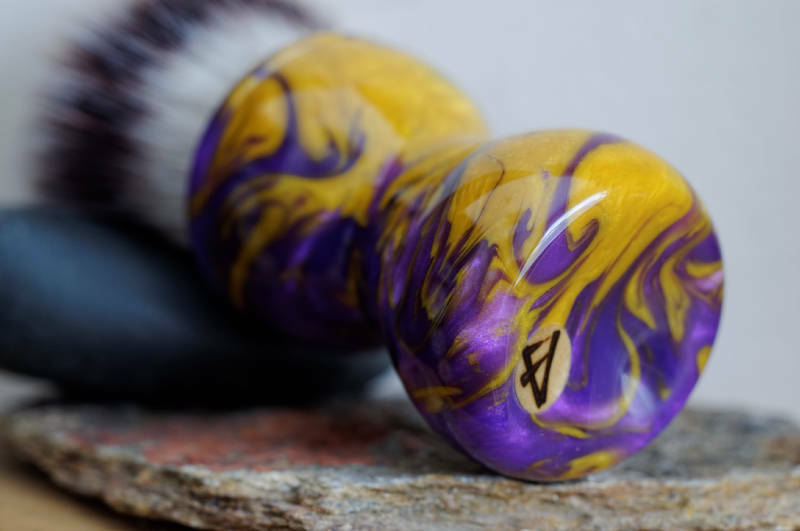 Just completed a custom order. 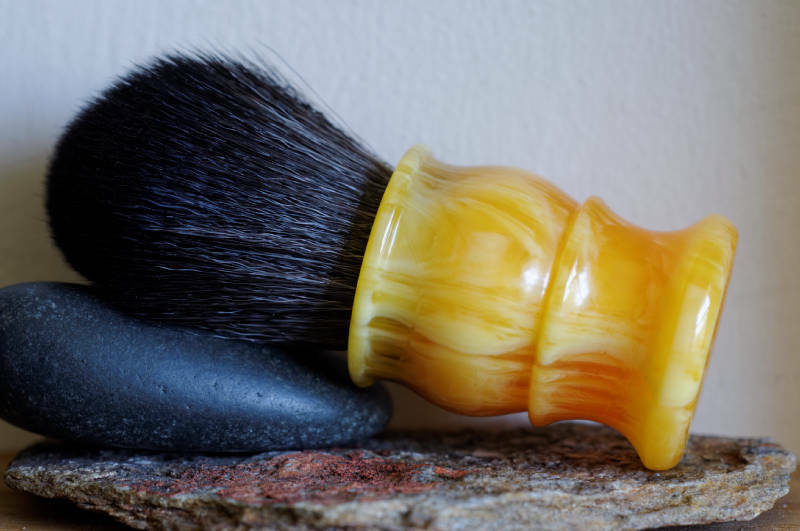 Molten Metal resin and two band finest badger. 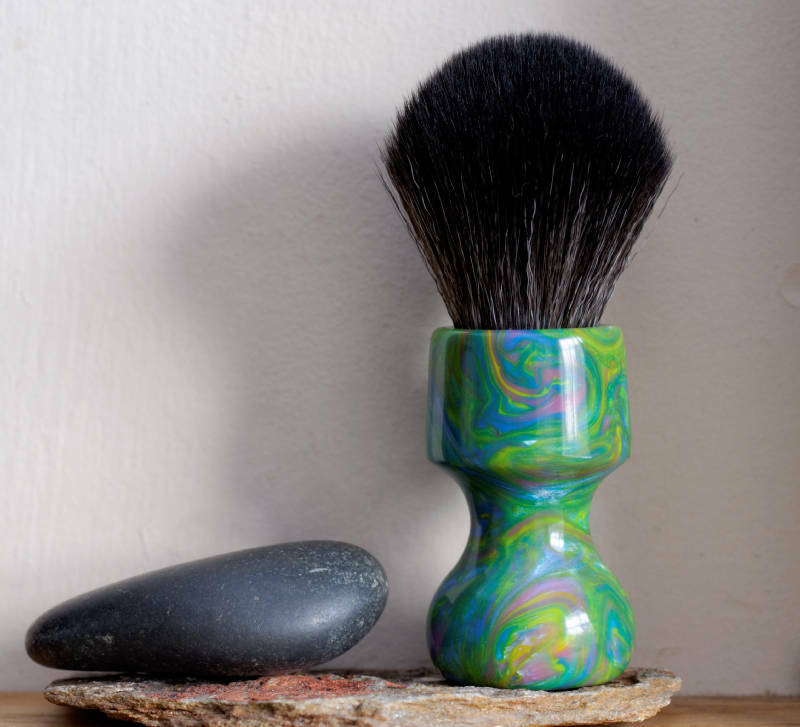 And a new BOSS knot brush for my Etsy shop. 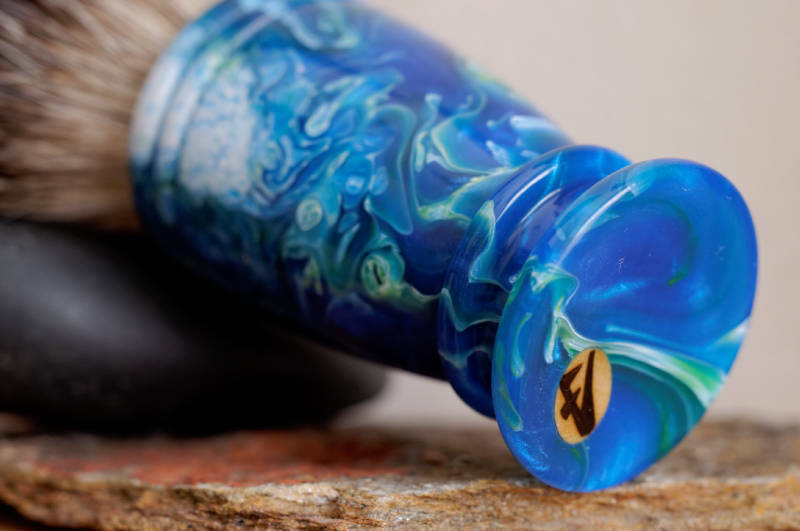 Molten Metal resin handle. 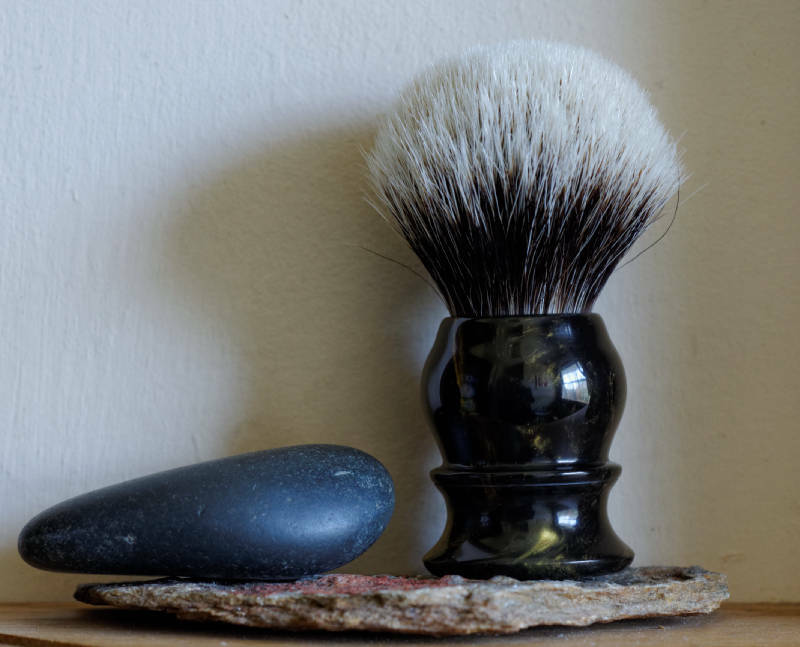 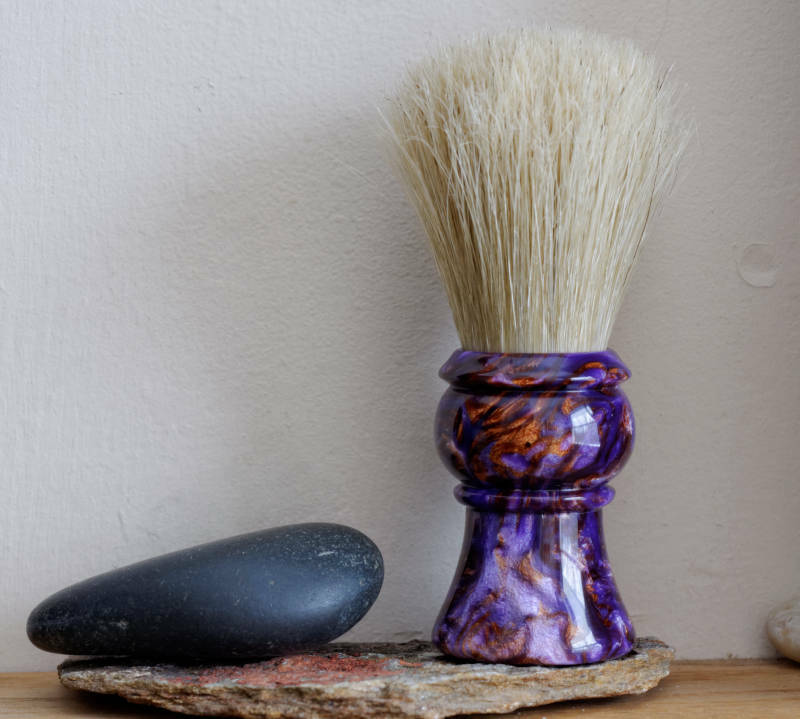 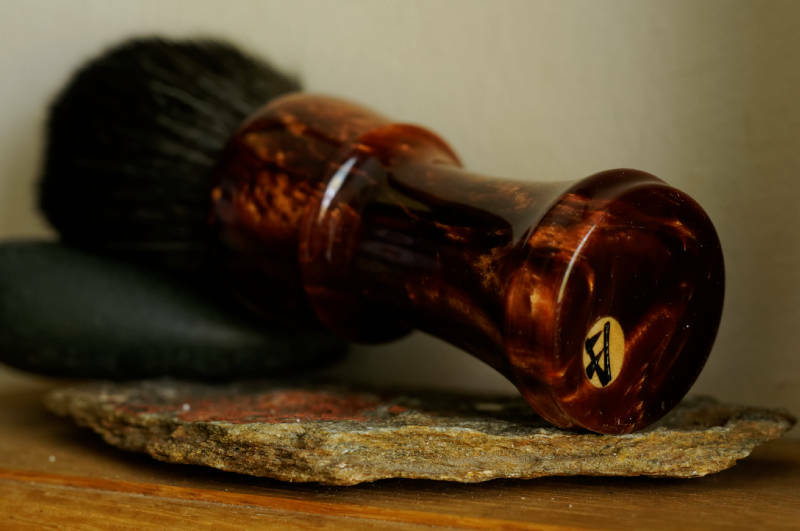 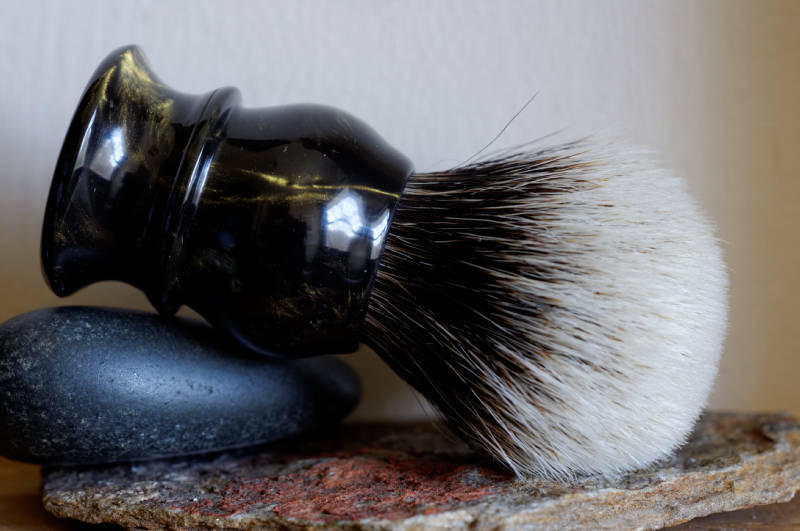 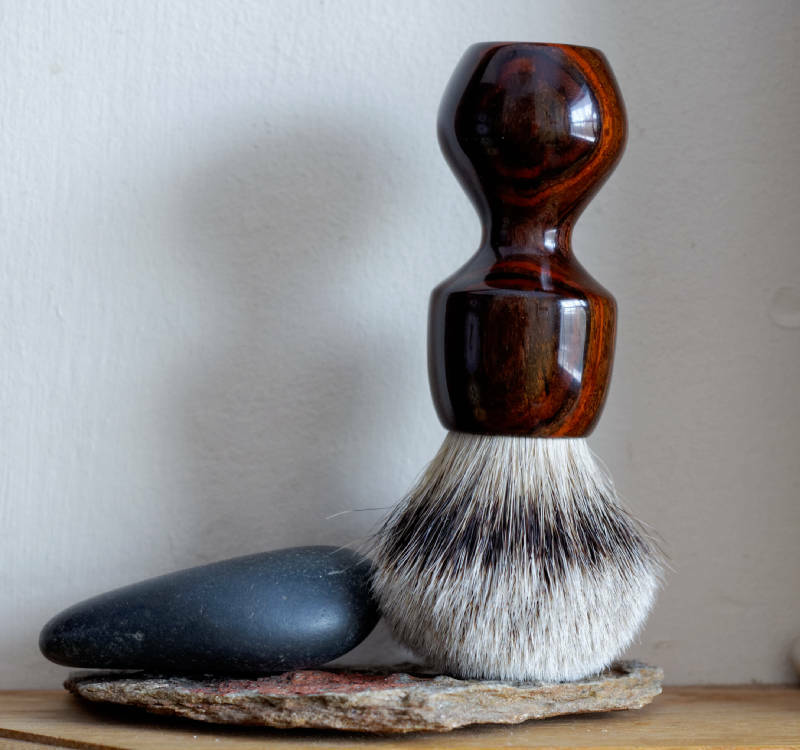 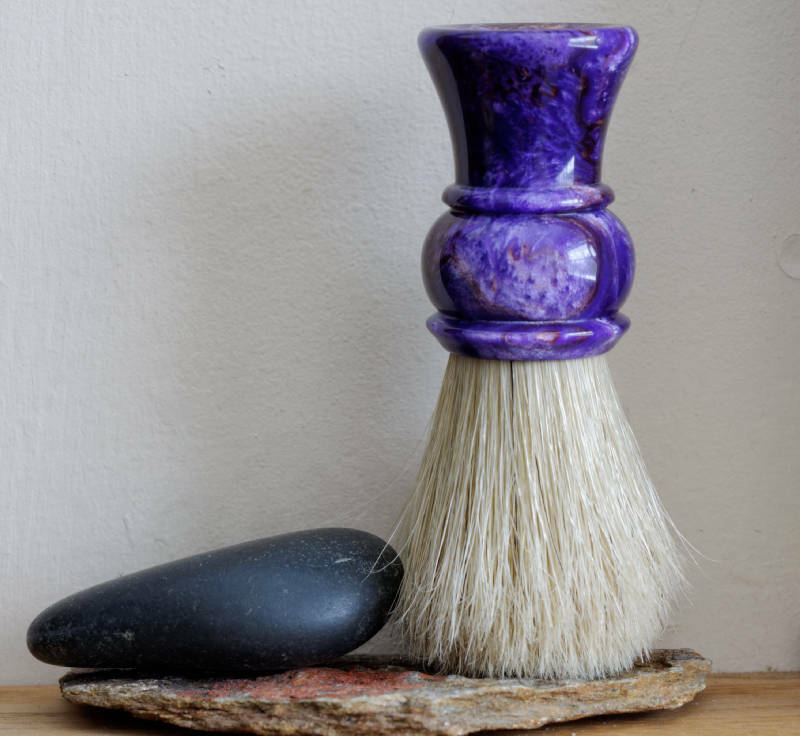 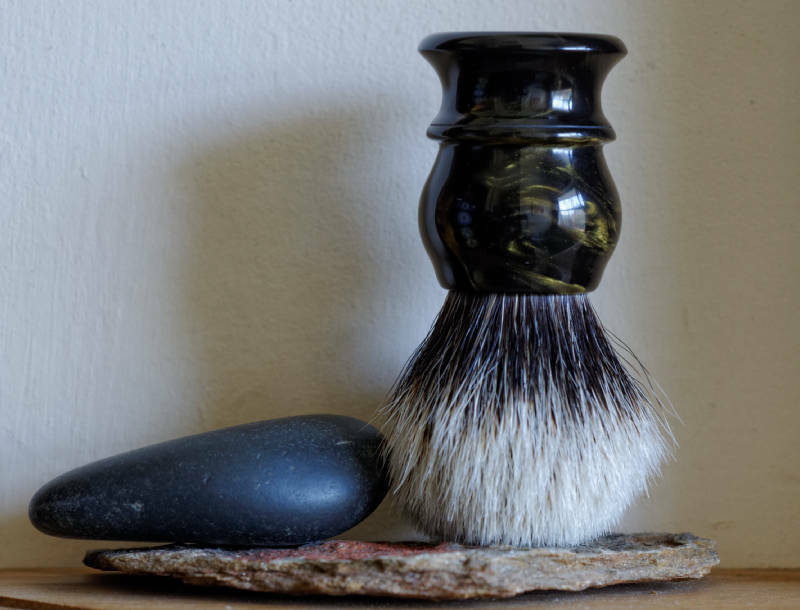 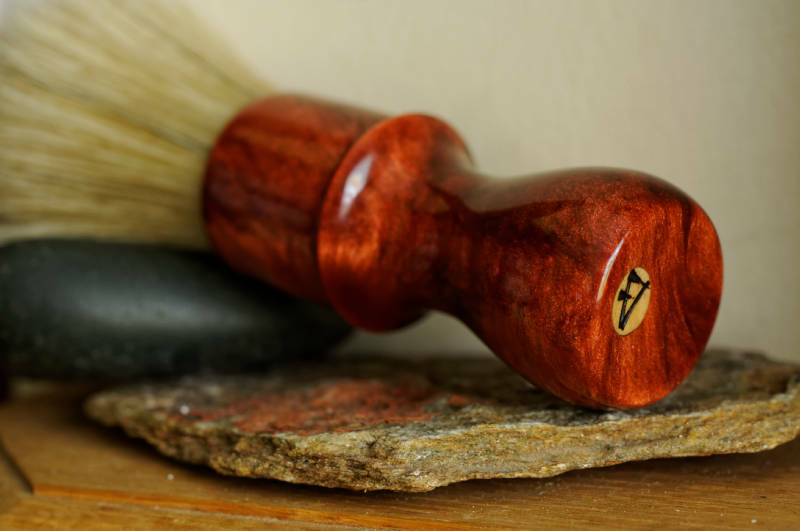 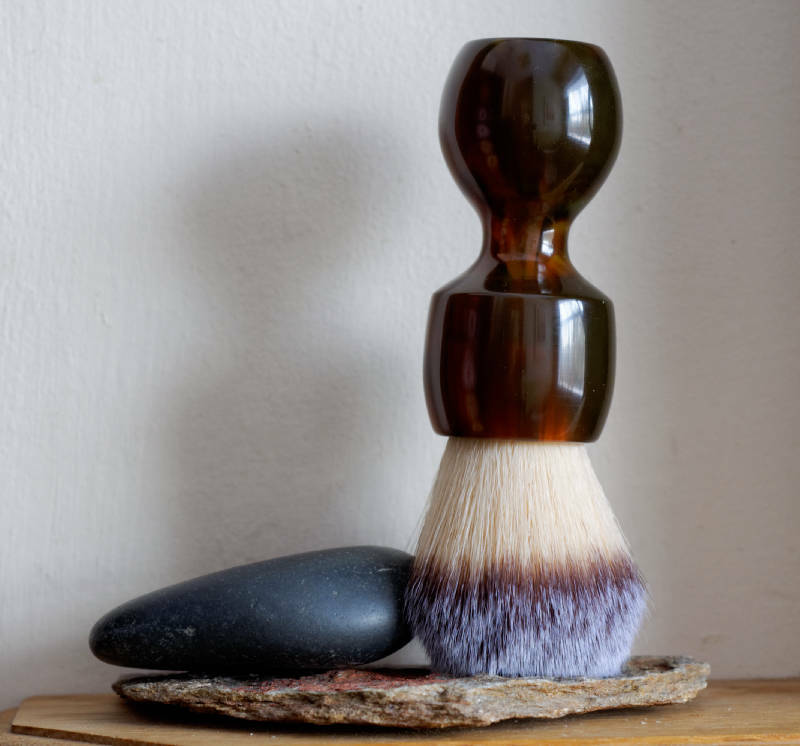 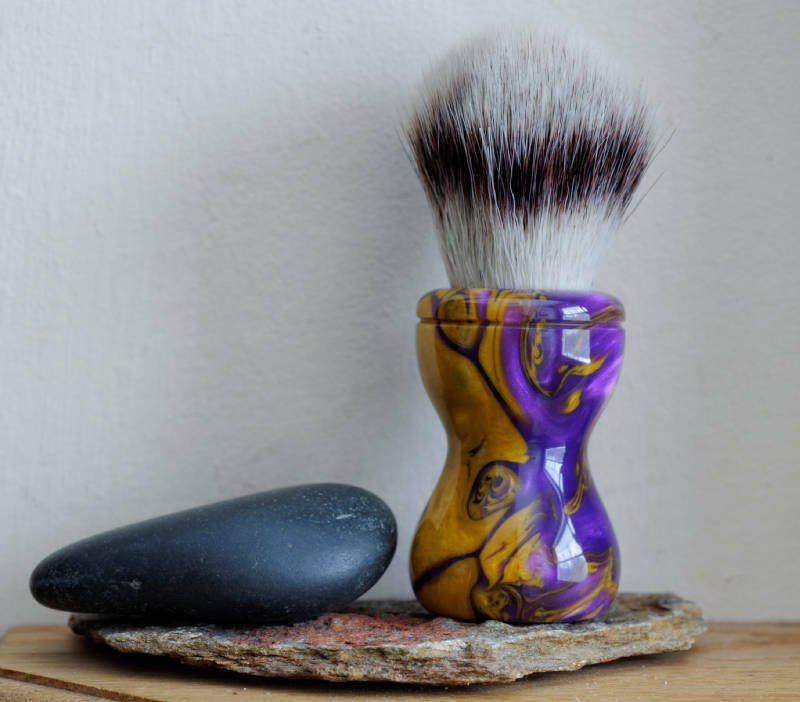 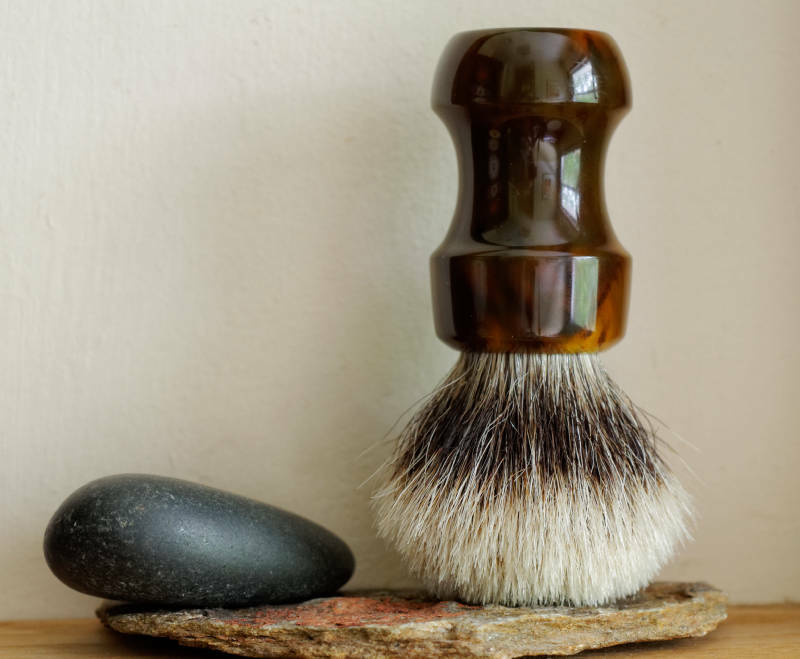 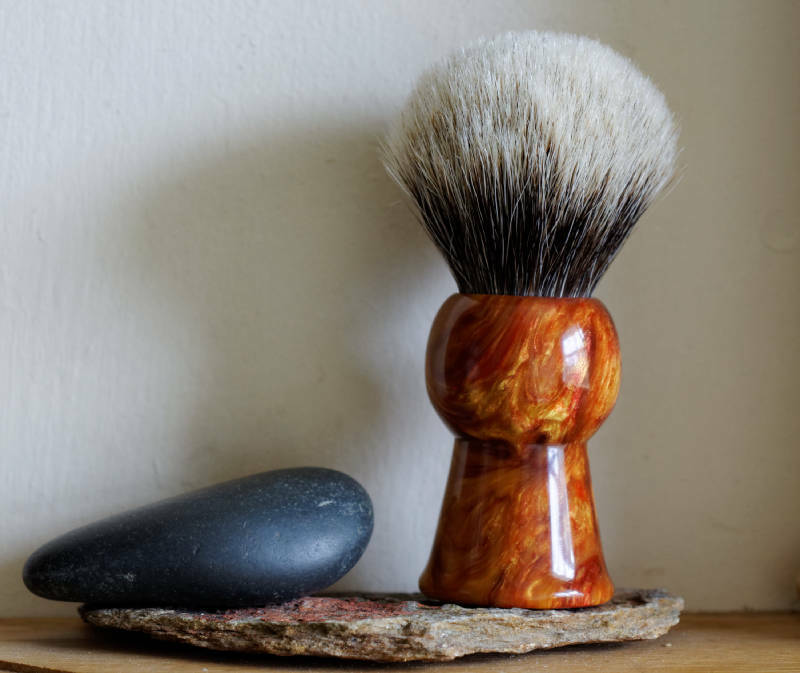 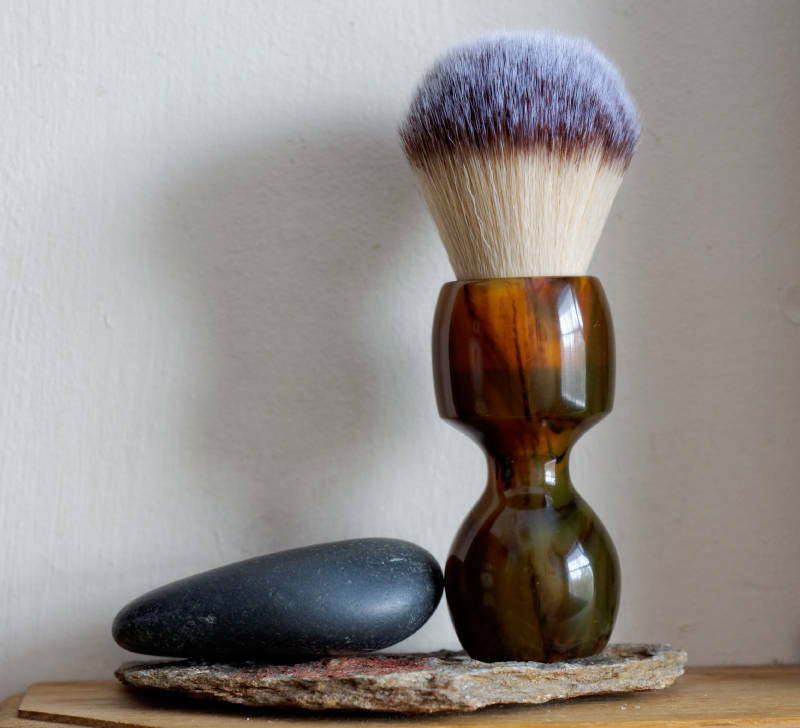 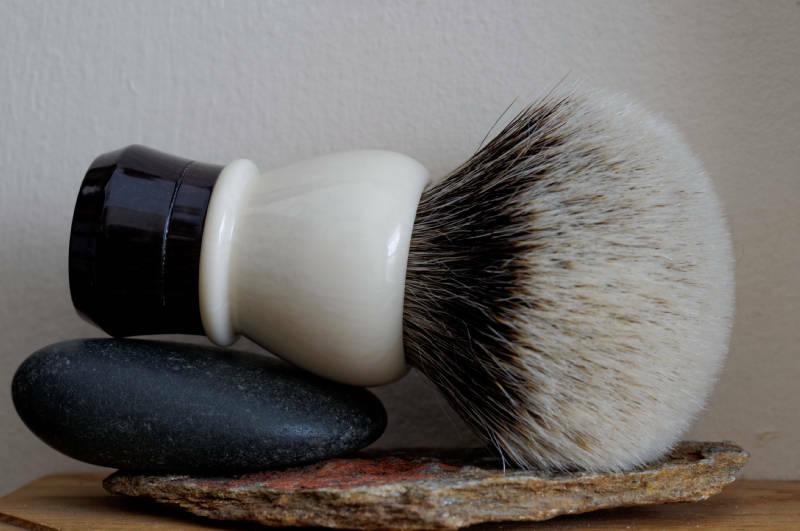 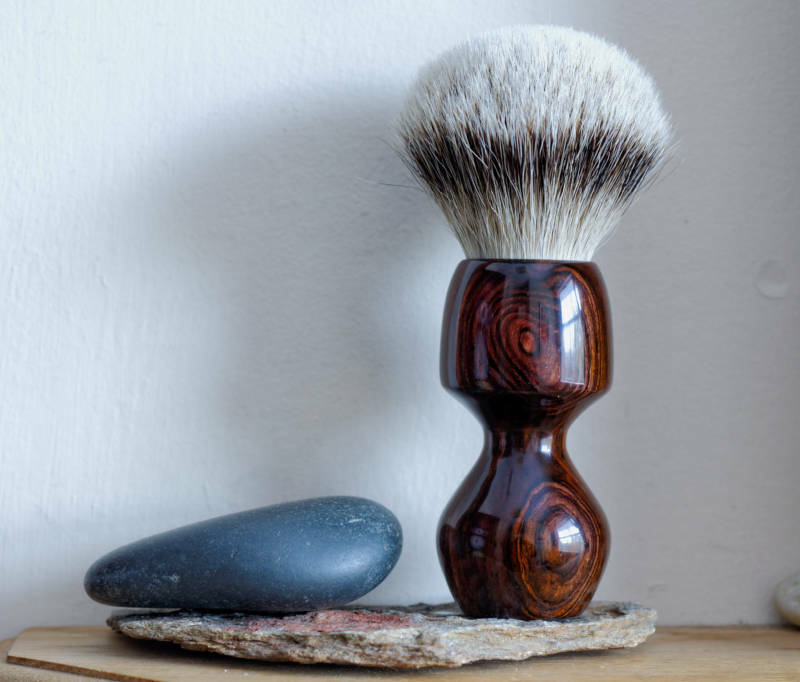 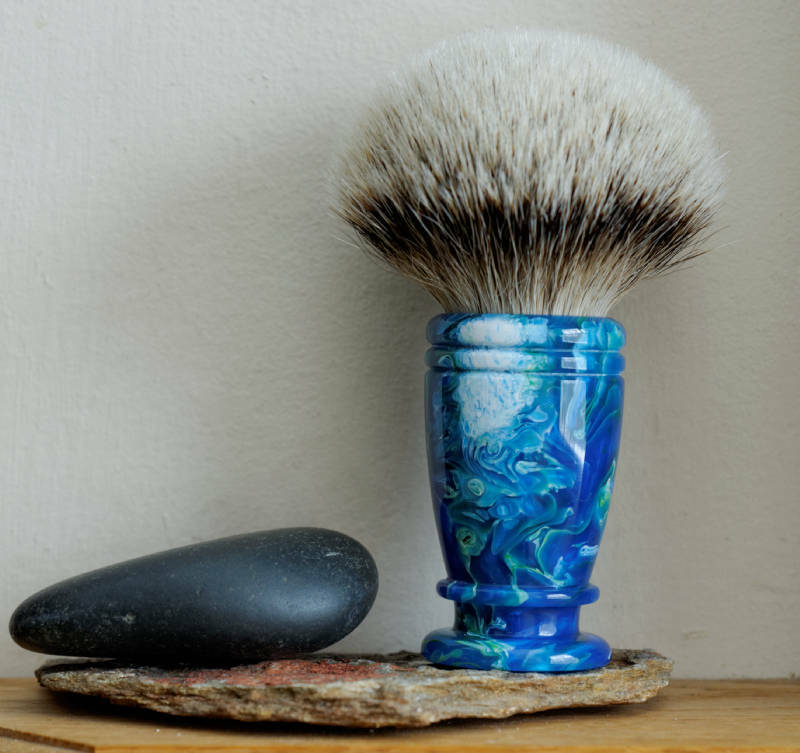 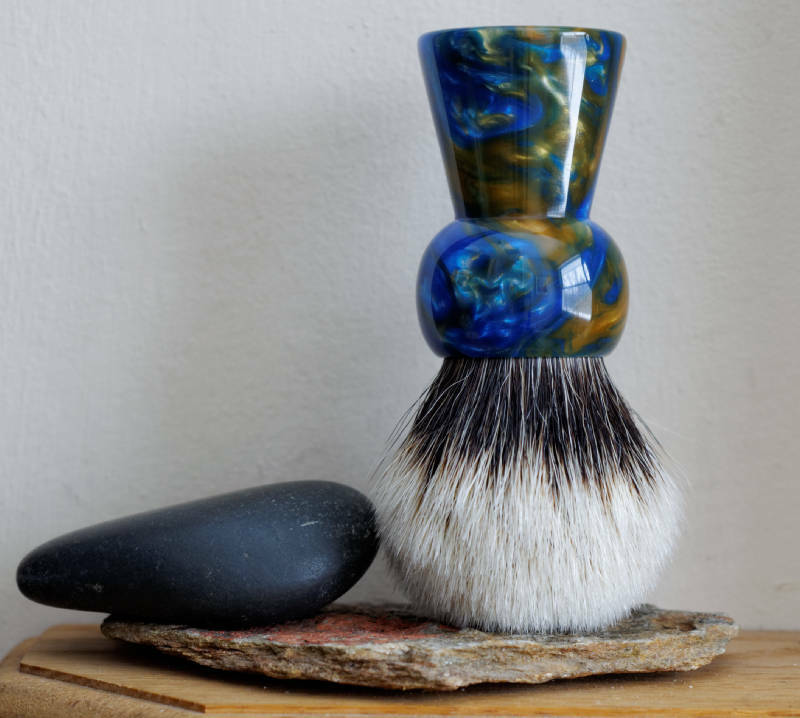 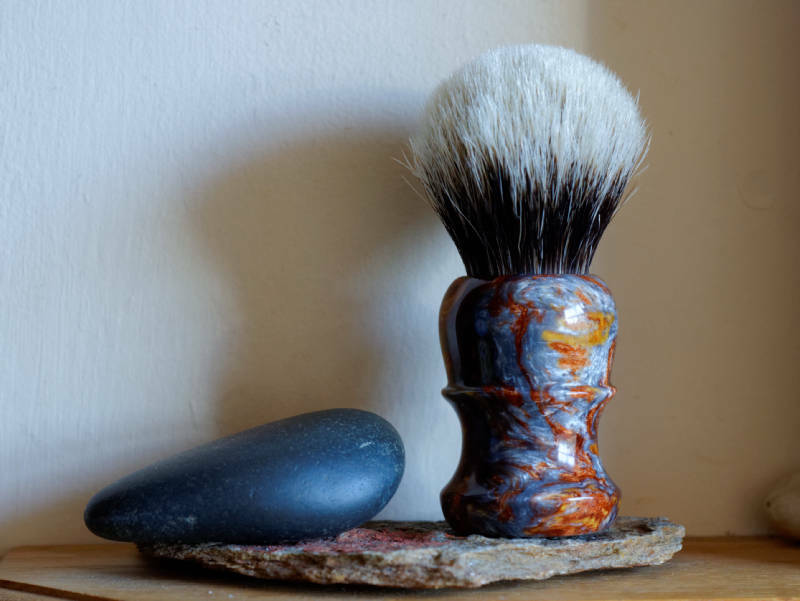 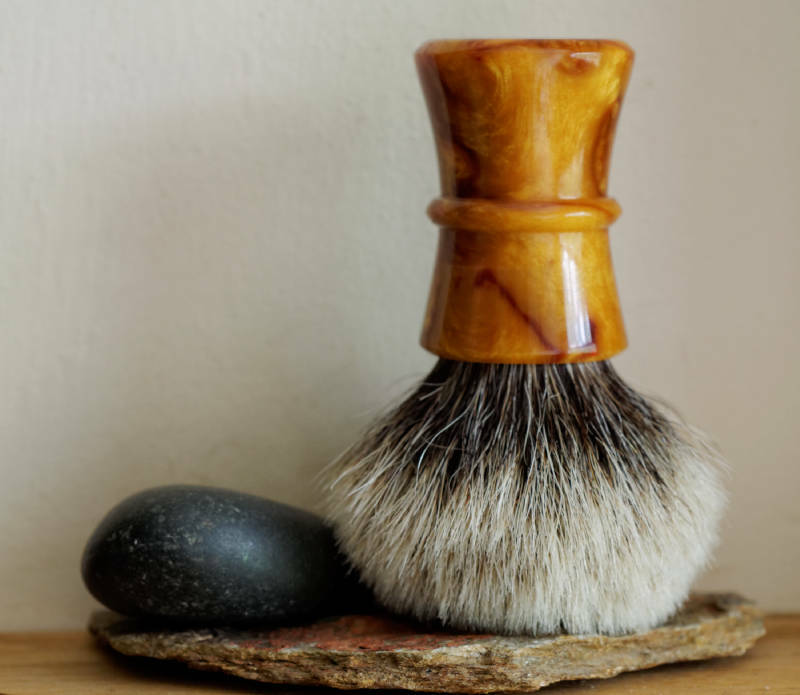 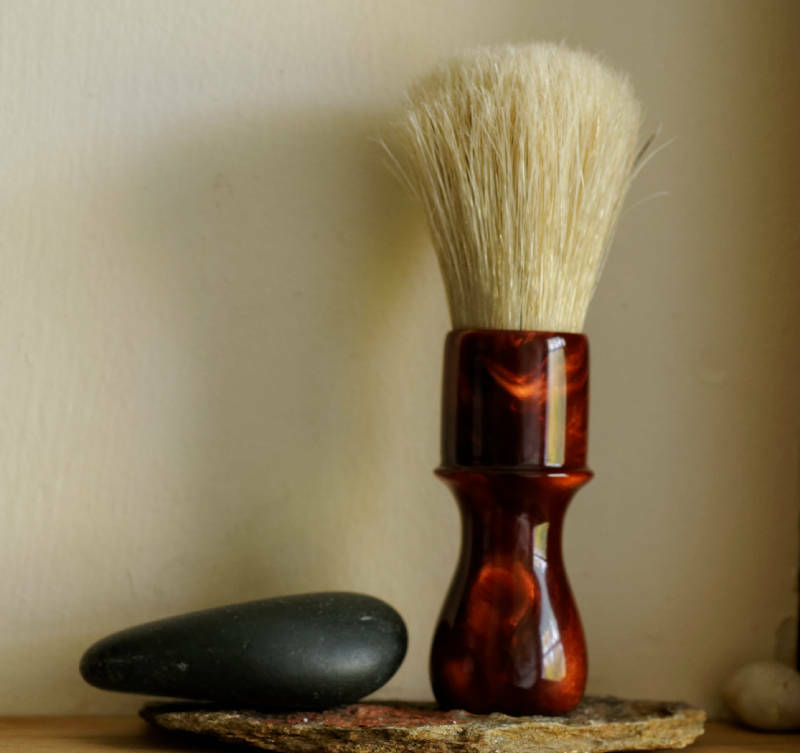 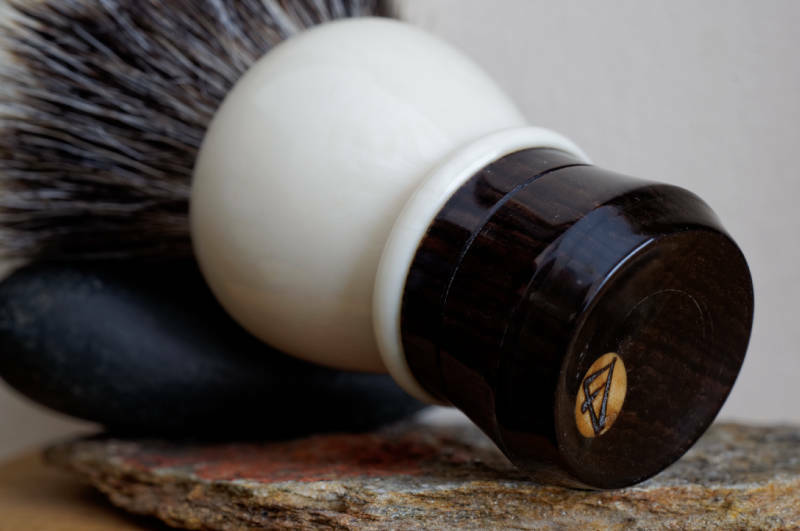 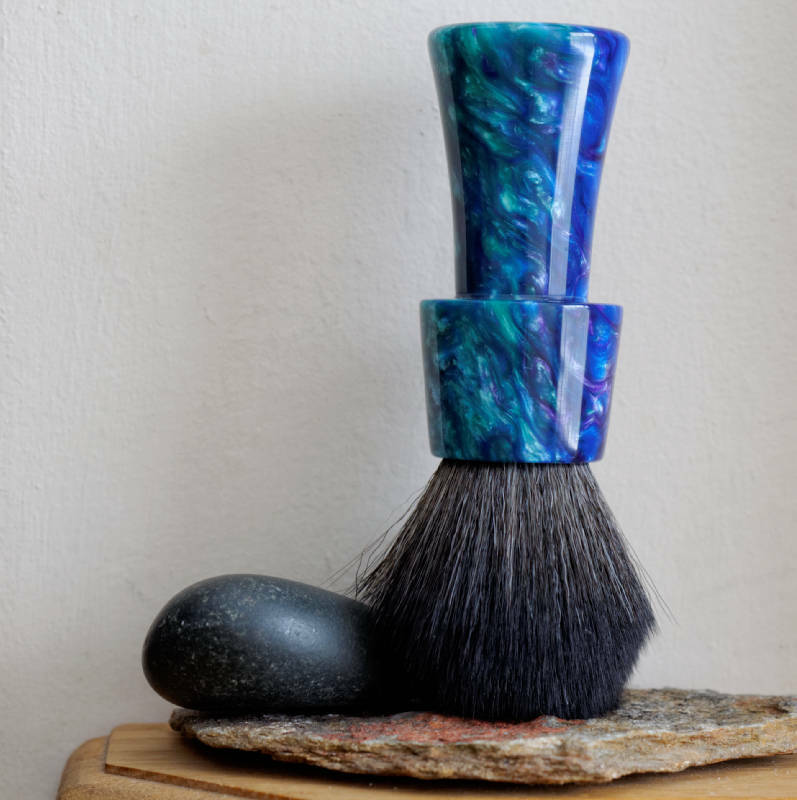 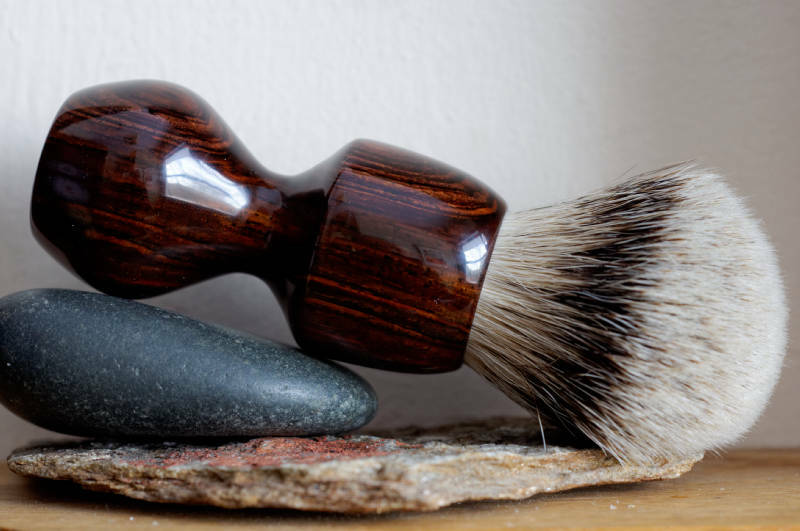 I have completed two shaving brushes for a custom order. 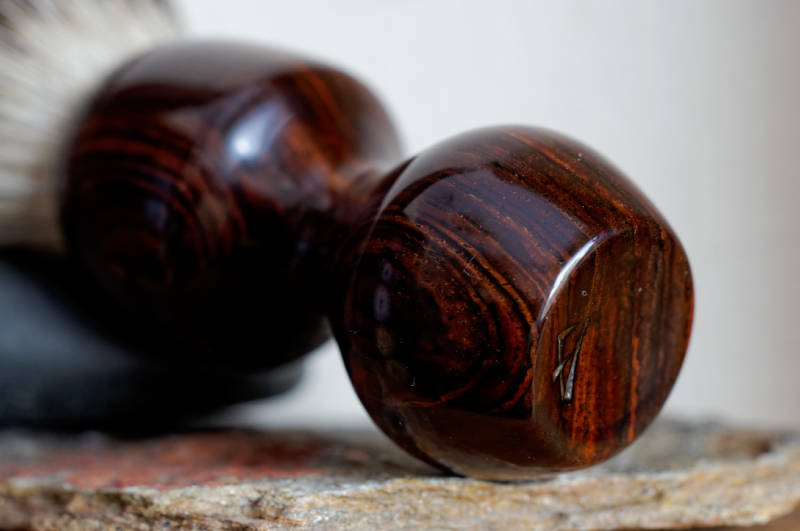 First one is made with cocobolo wood and finished in 9-12 coats of CA, sanded and polished to high gloss. 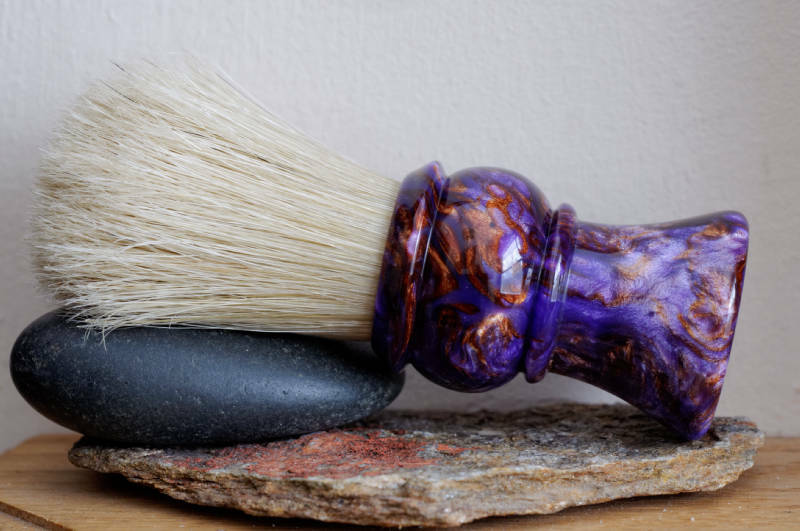 TGN three band premium silvertip knot. 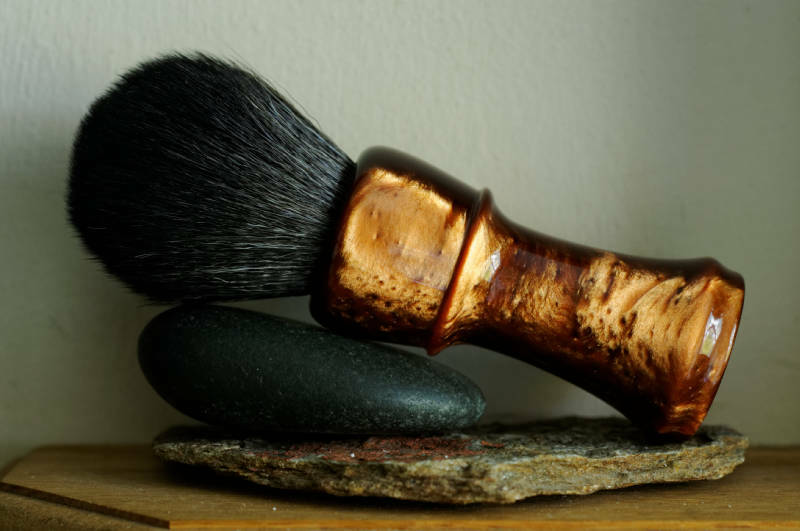 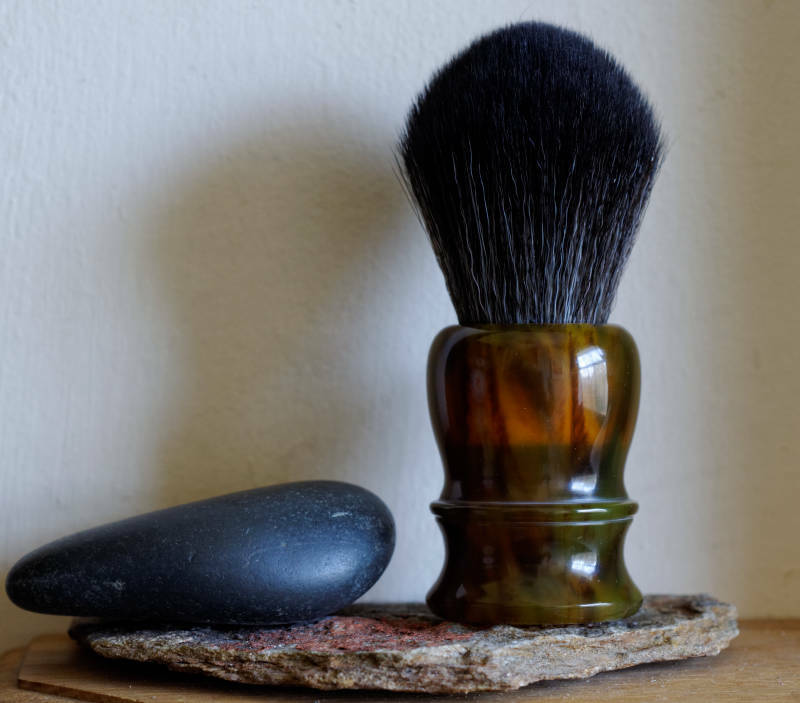 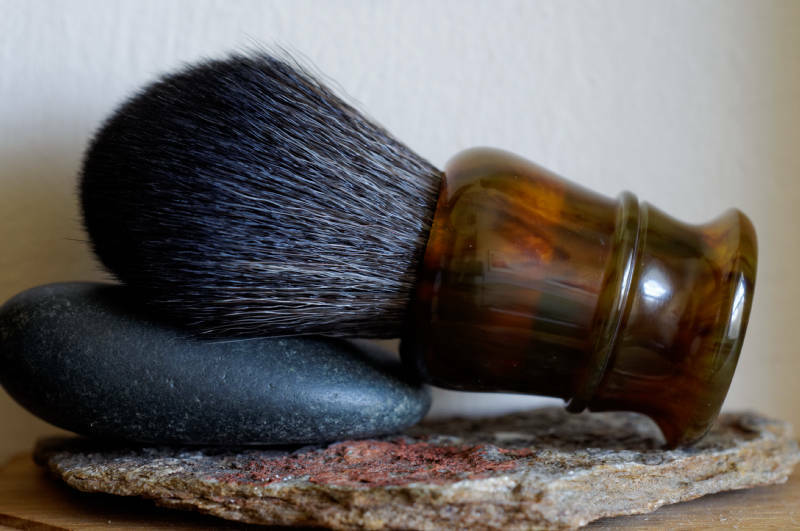 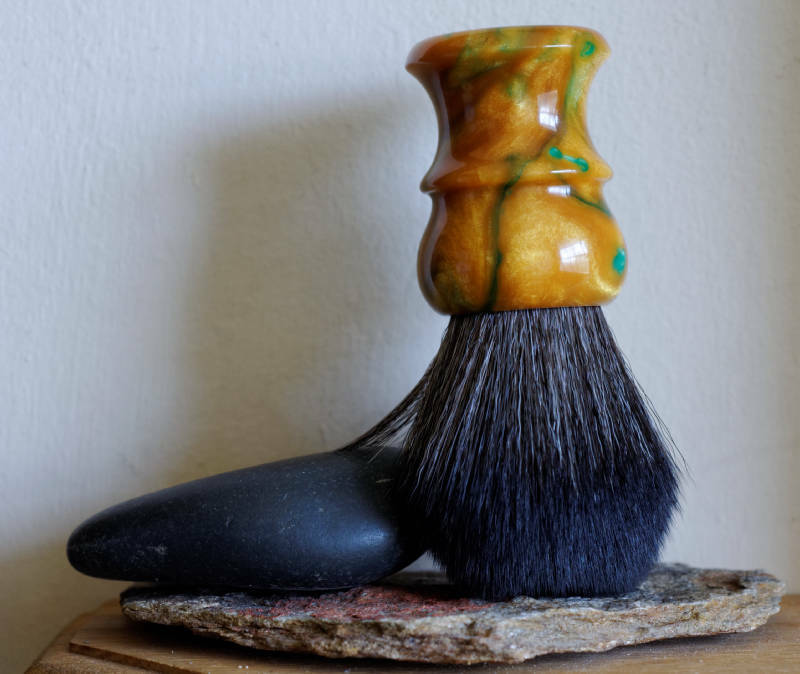 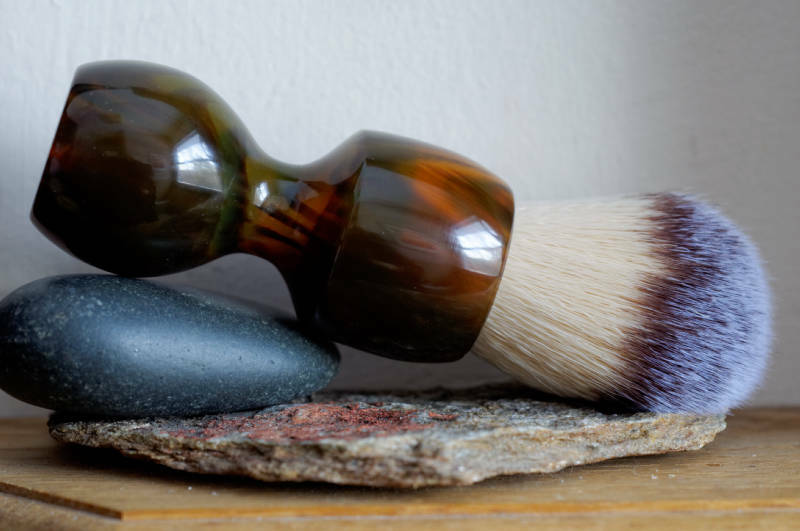 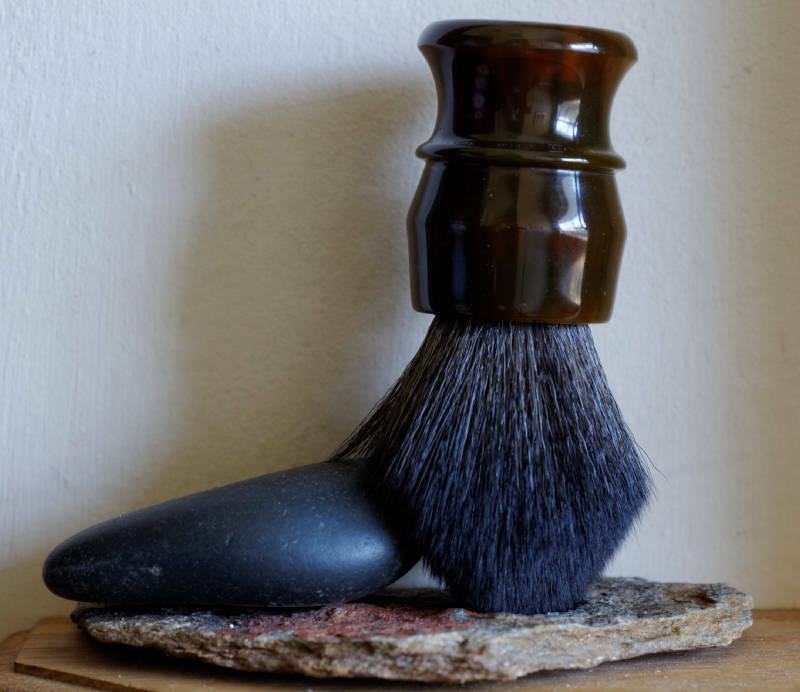 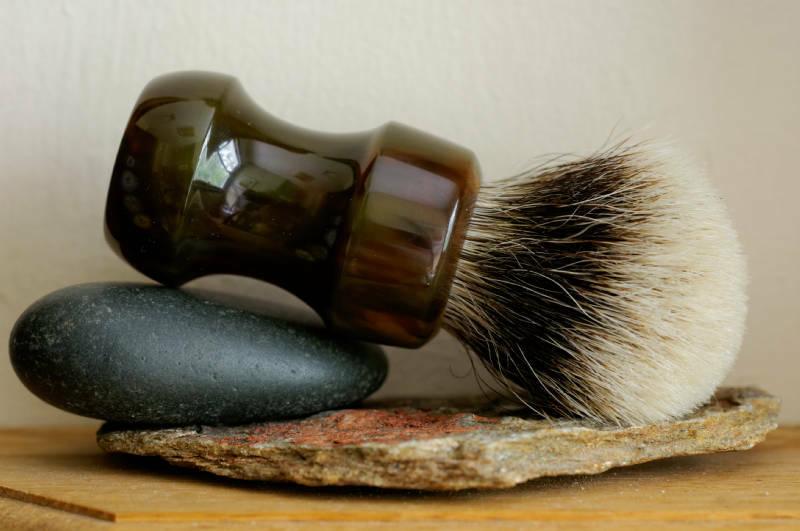 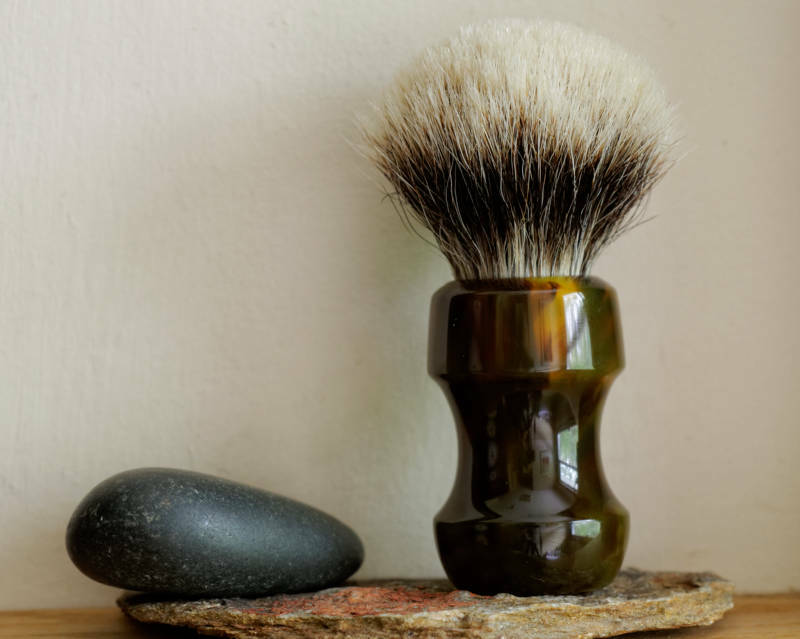 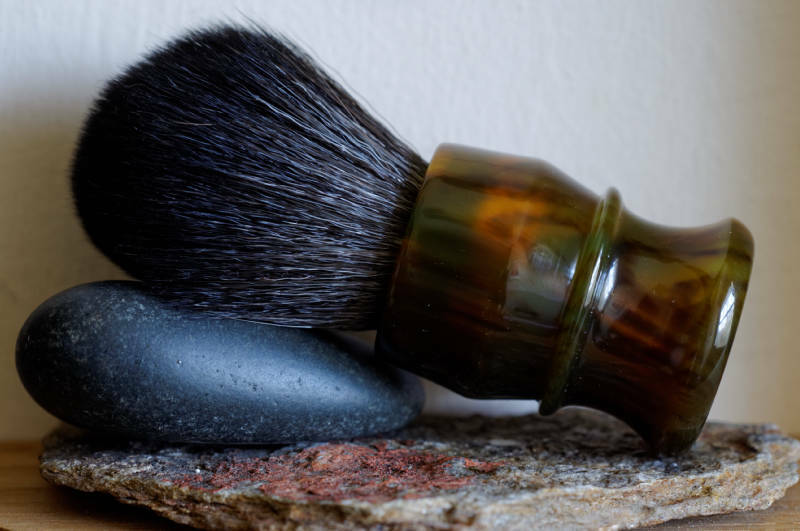 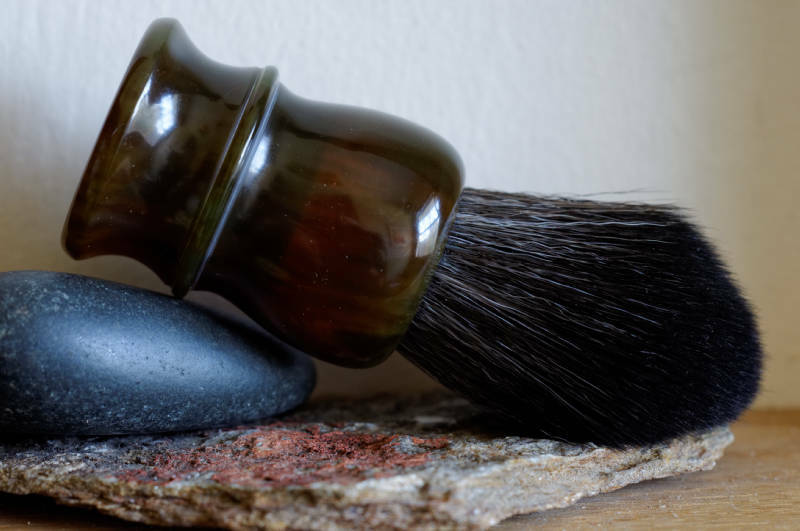 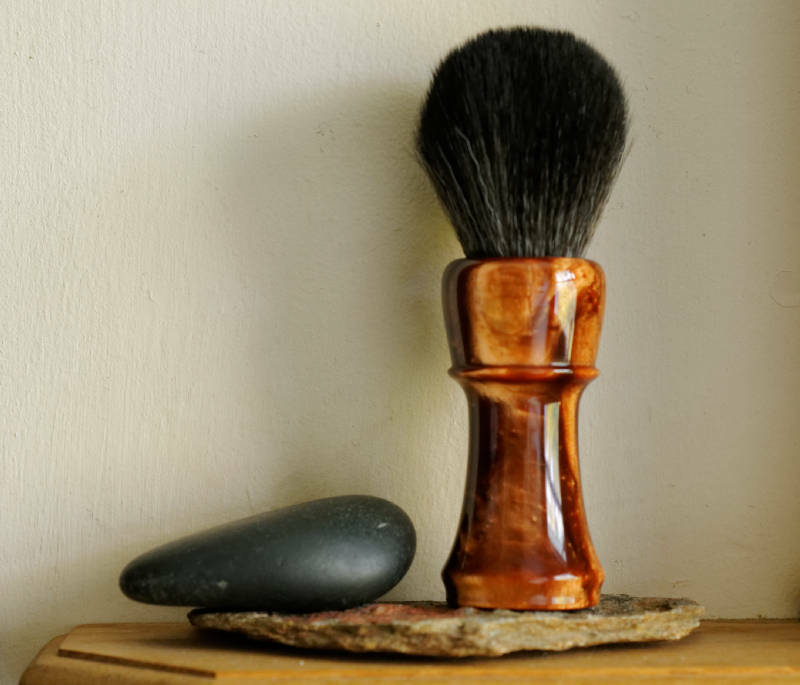 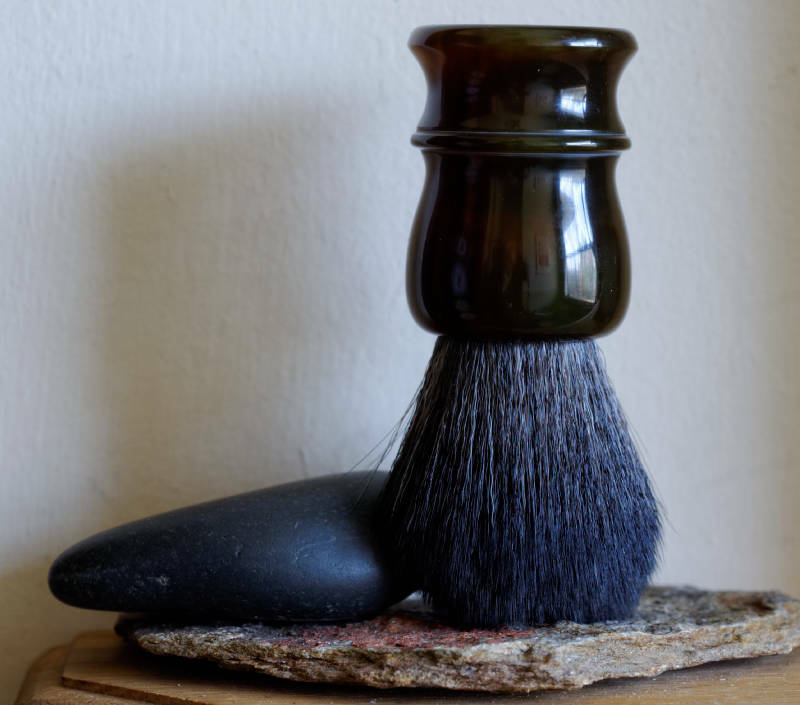 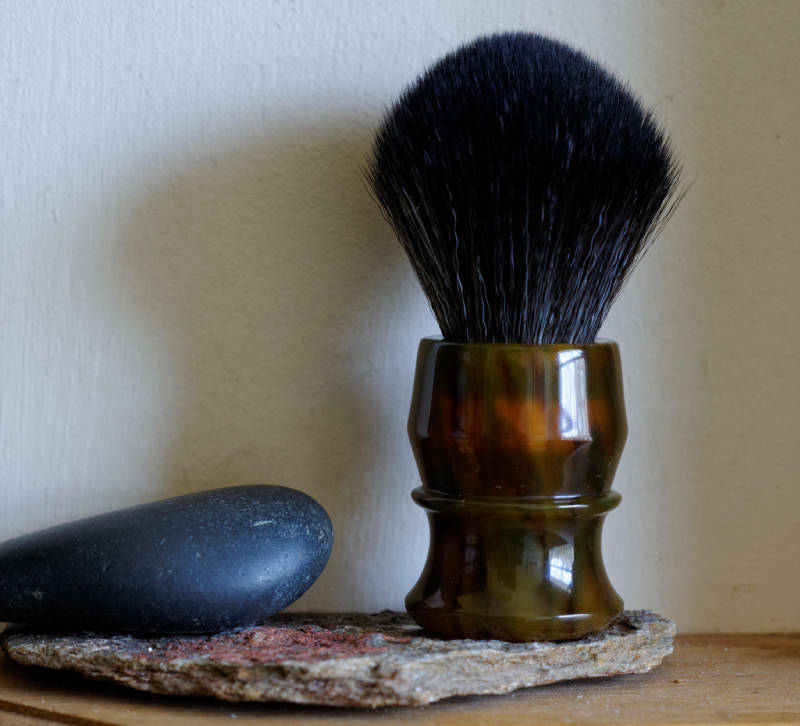 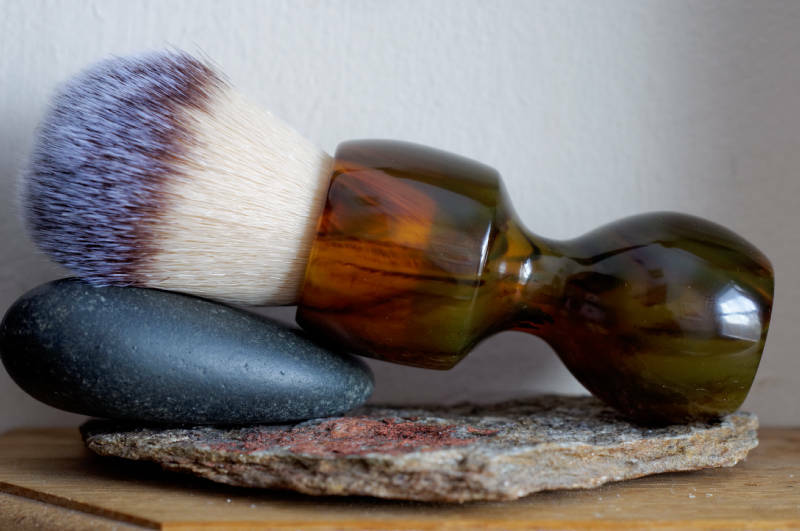 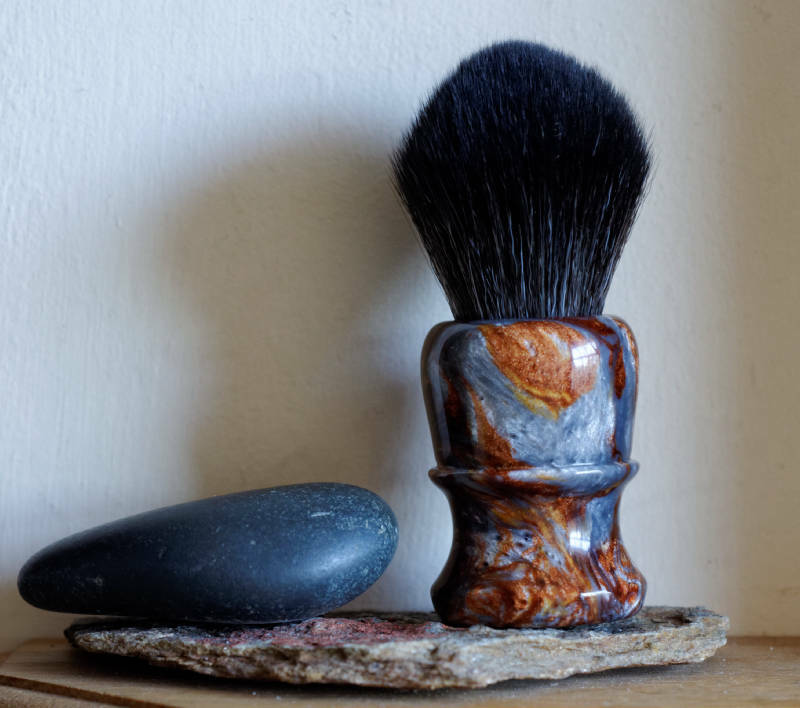 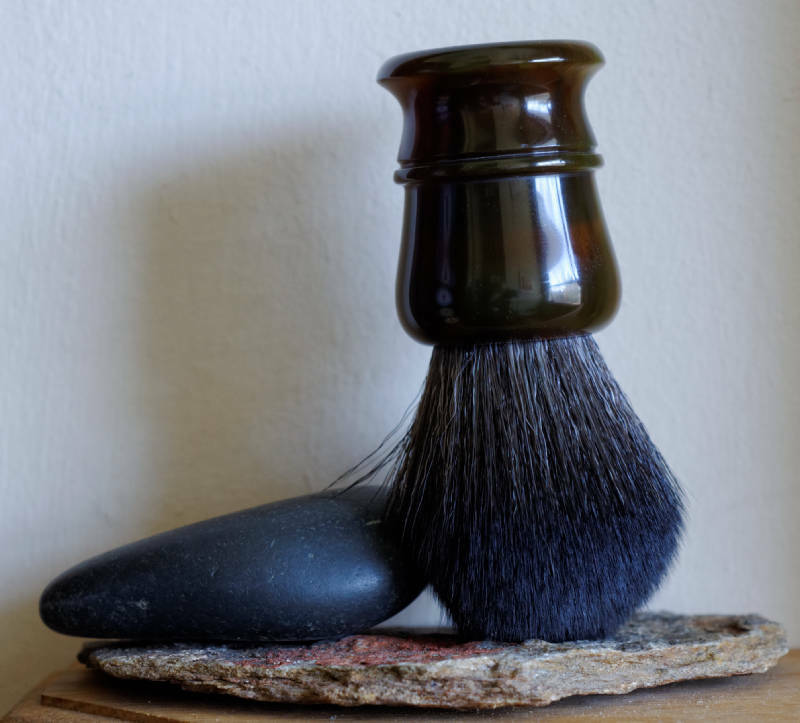 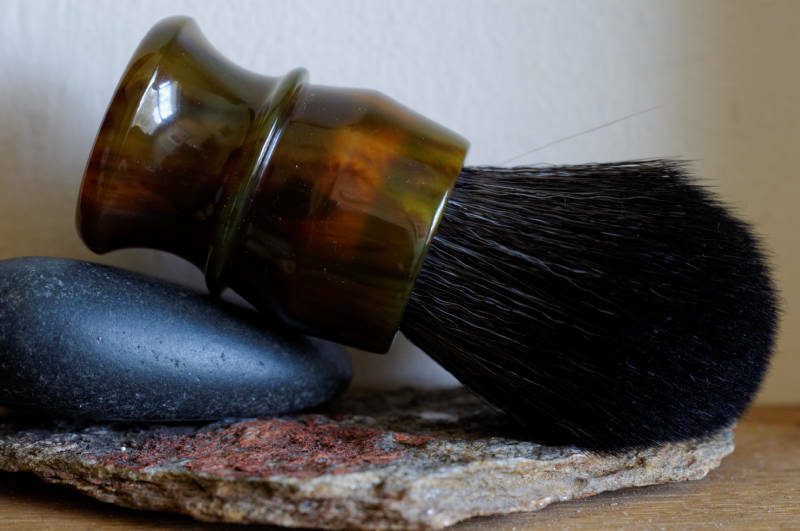 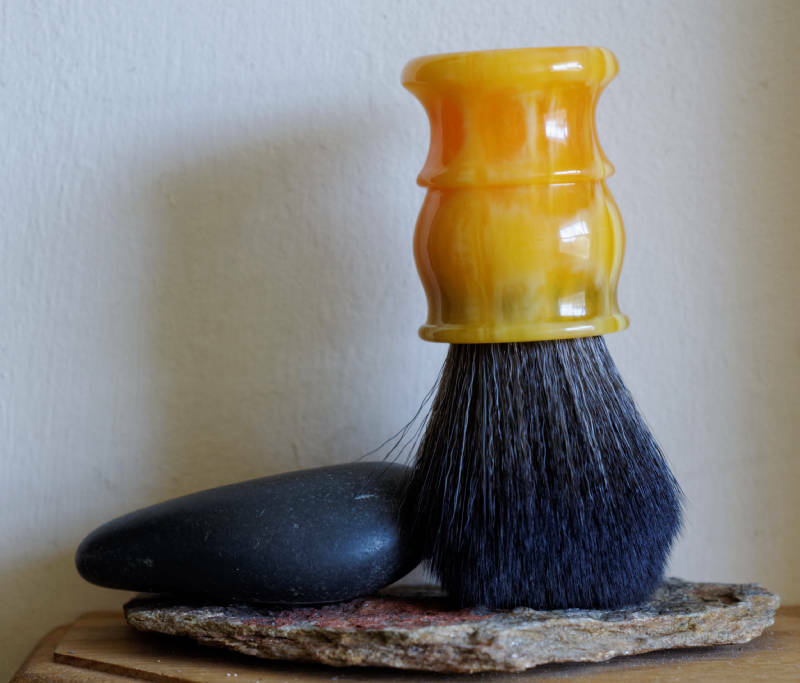 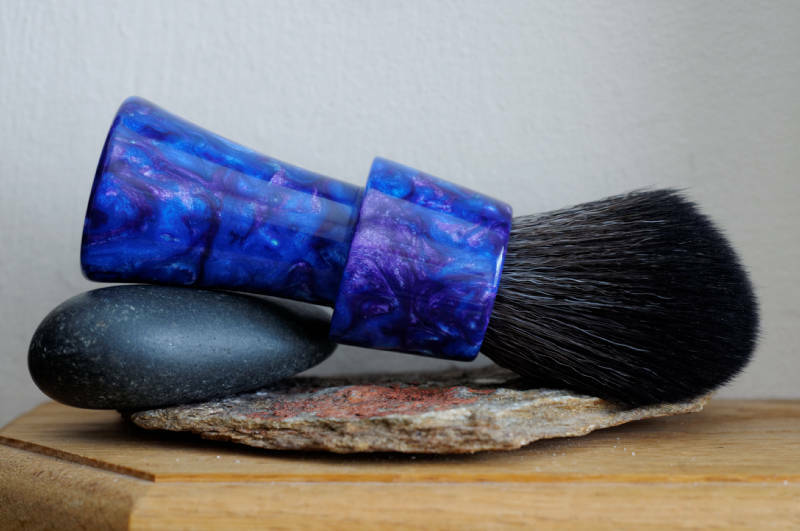 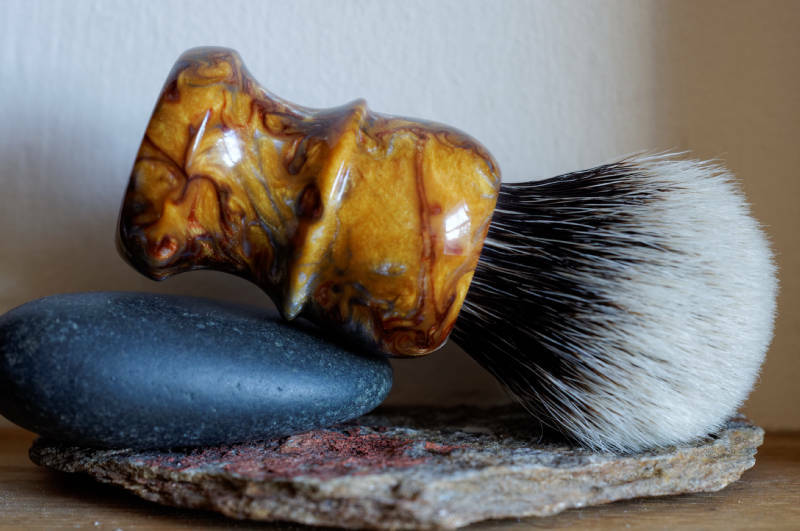 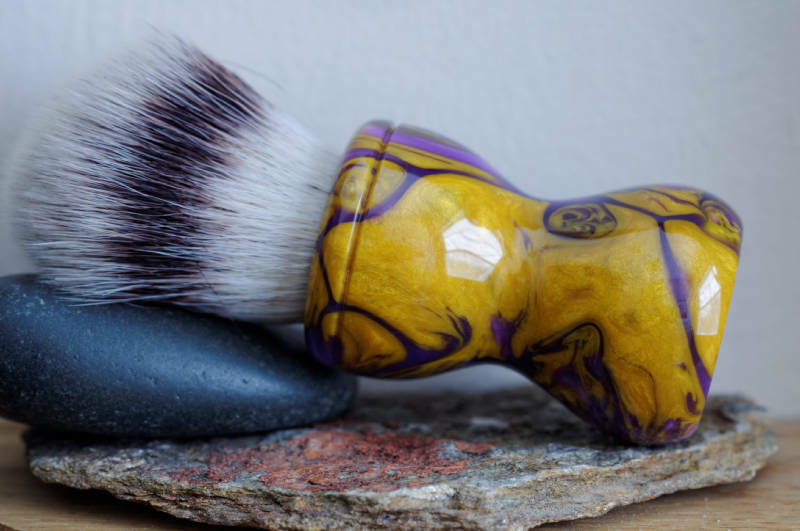 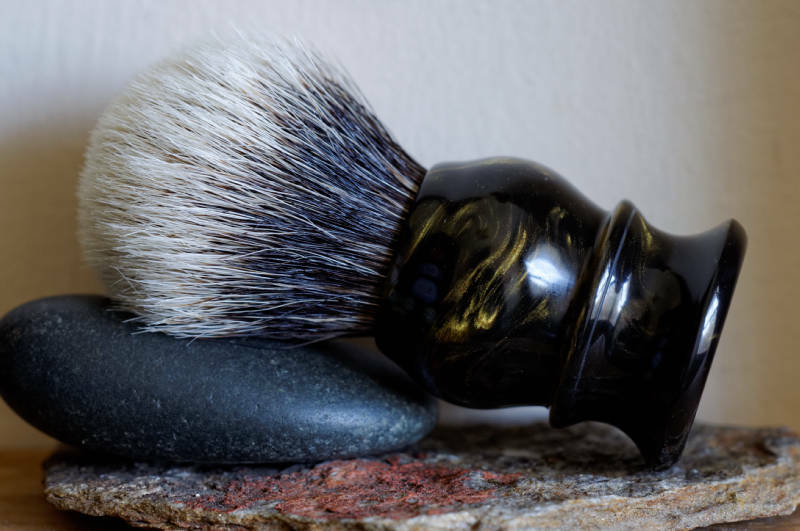 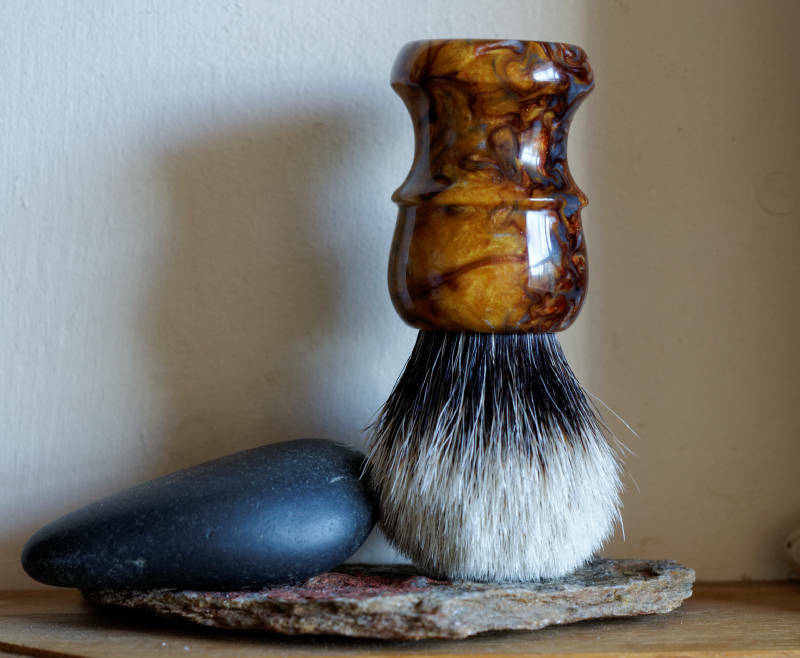 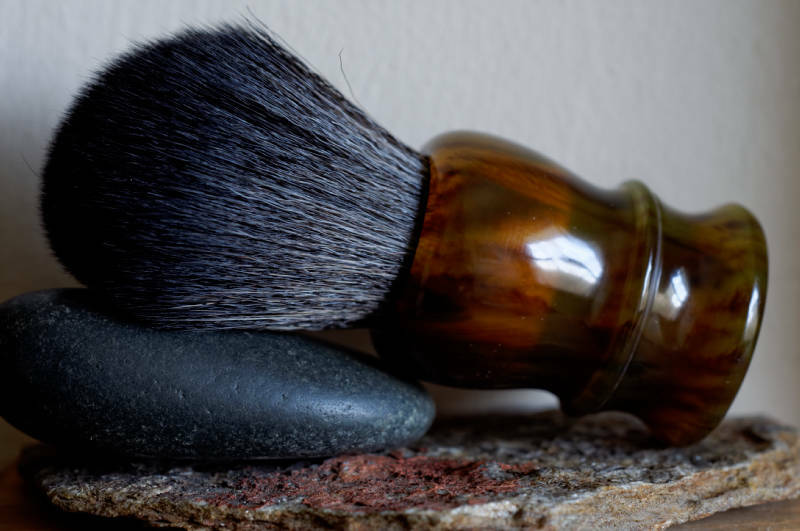 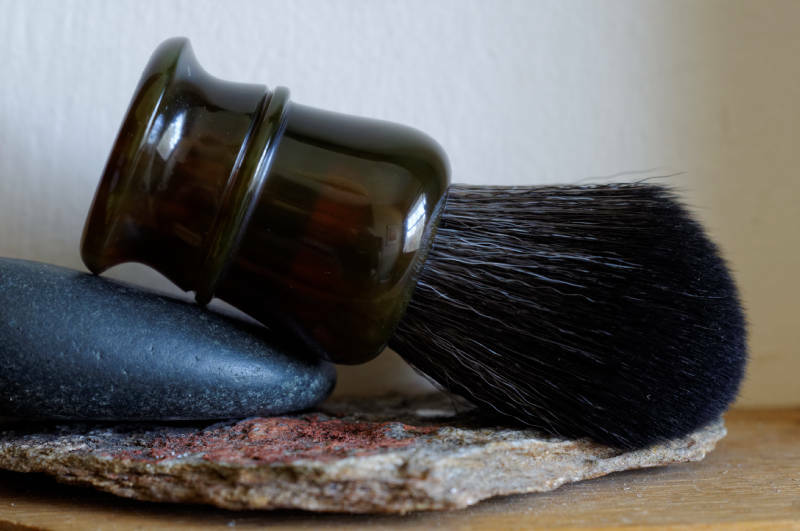 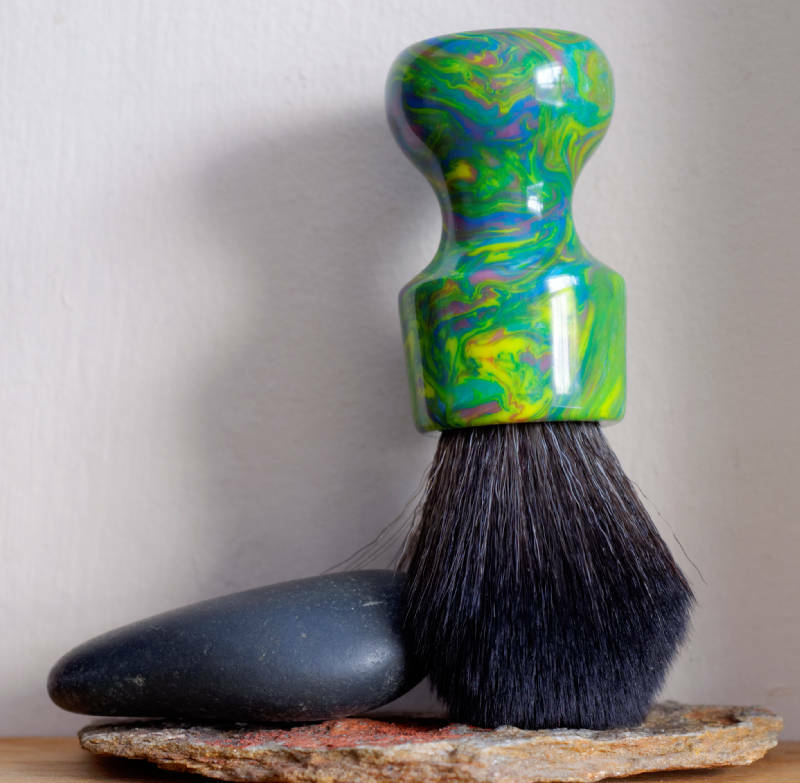 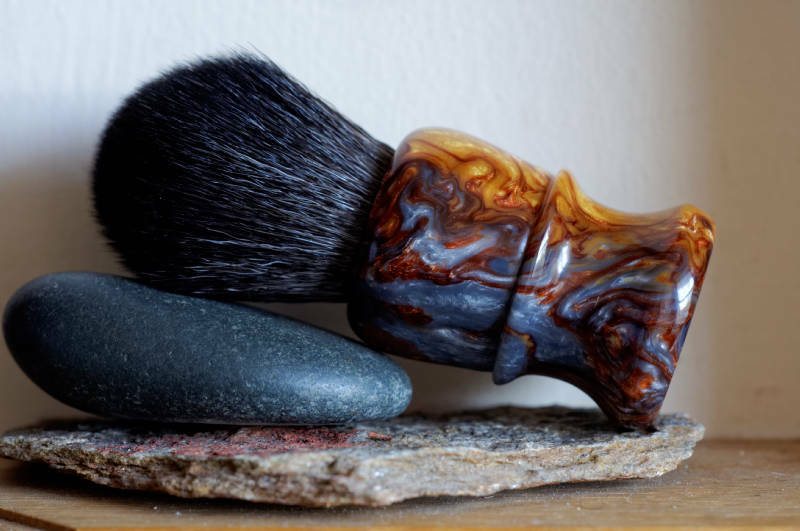 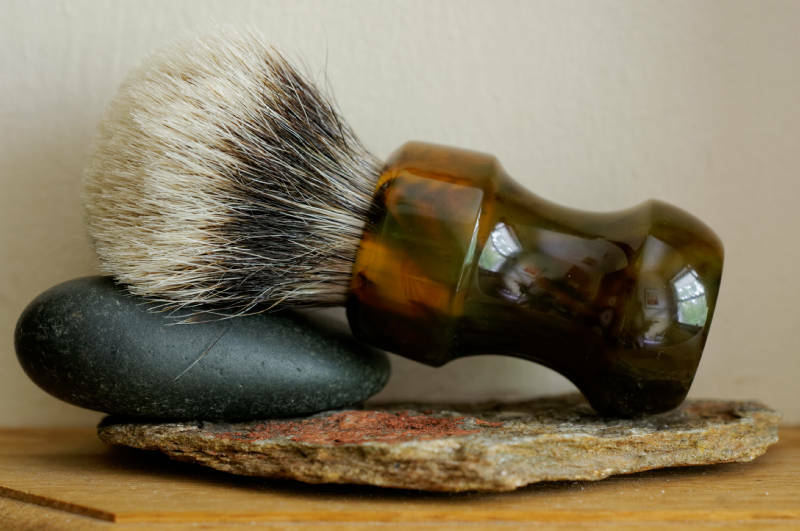 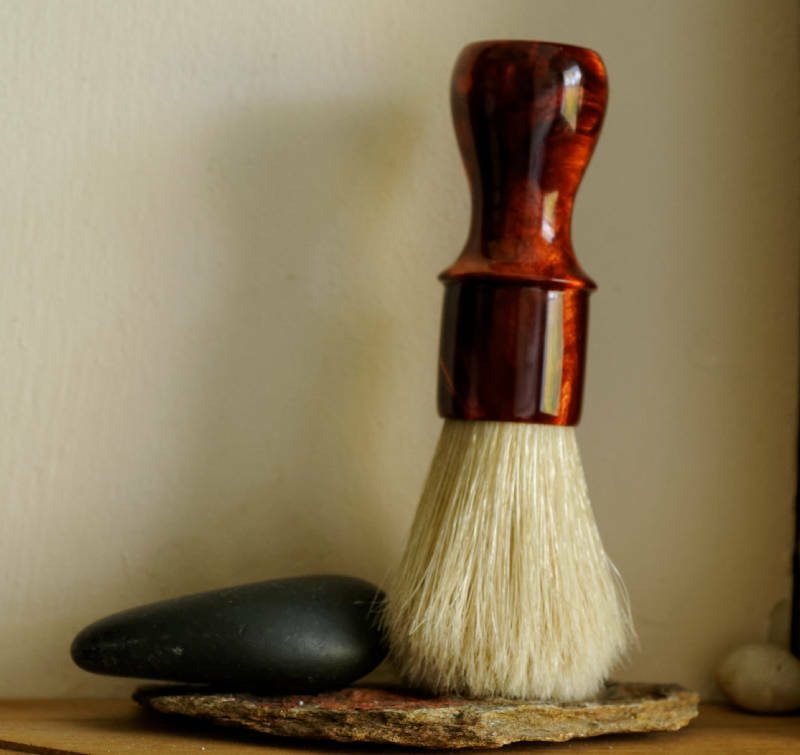 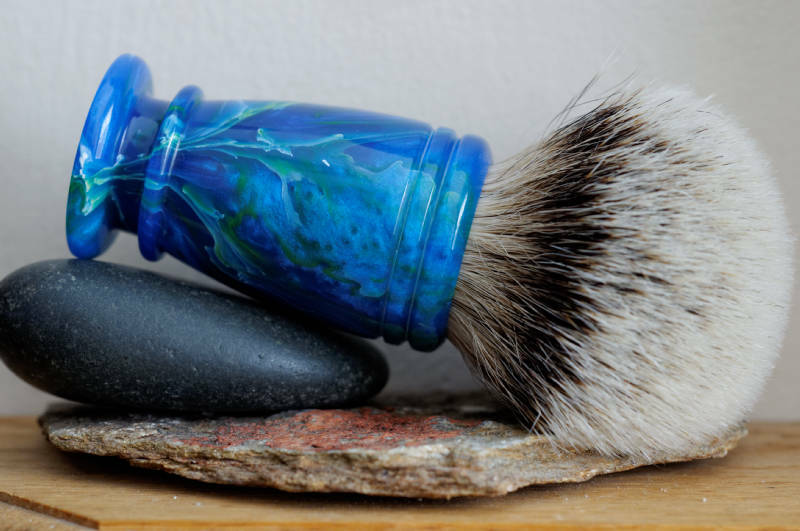 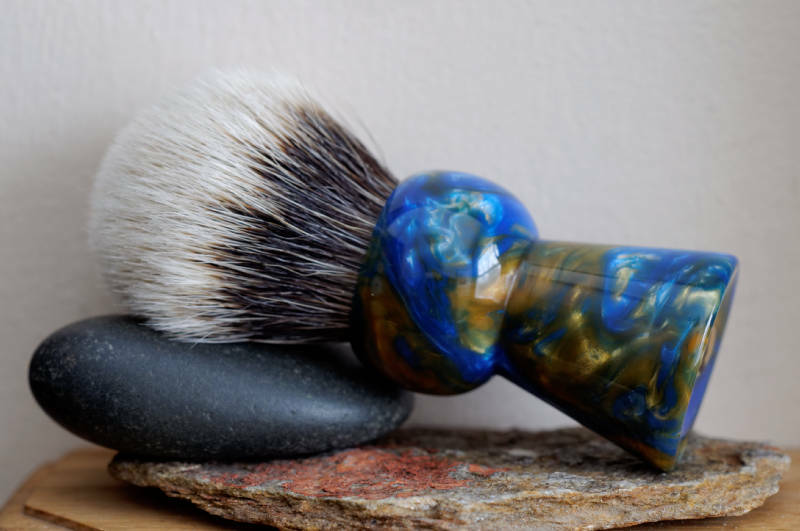 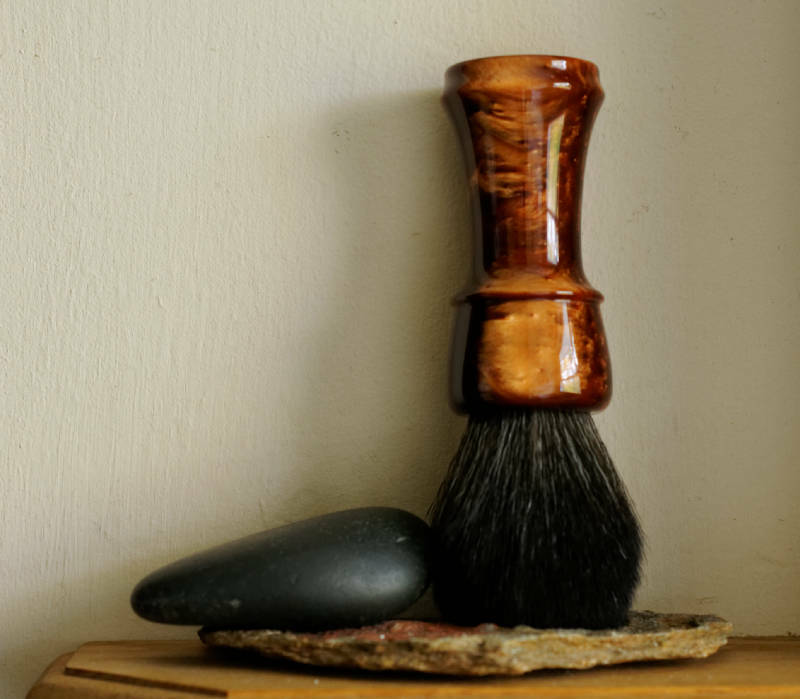 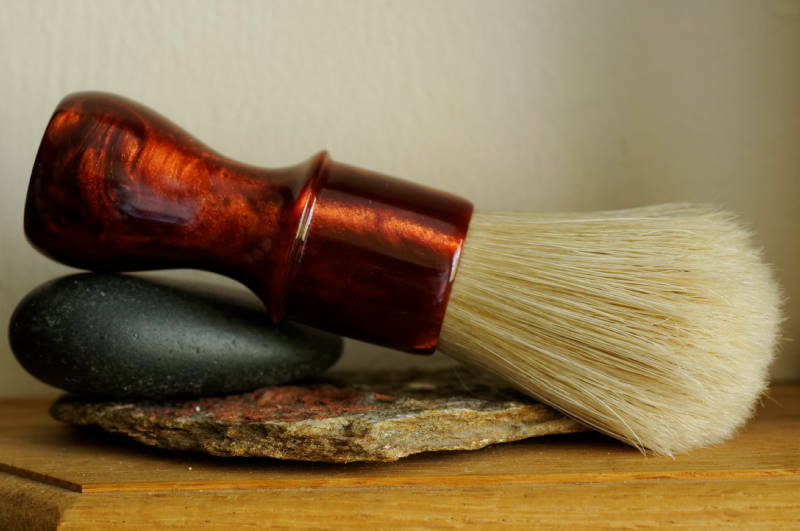 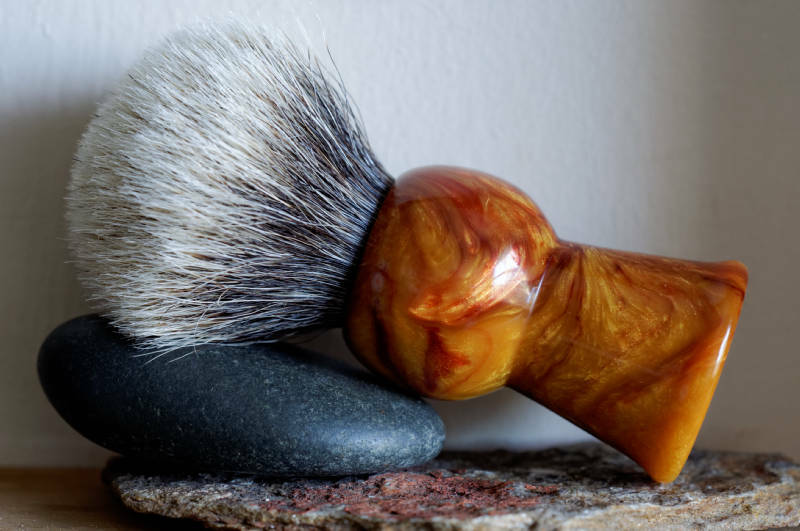 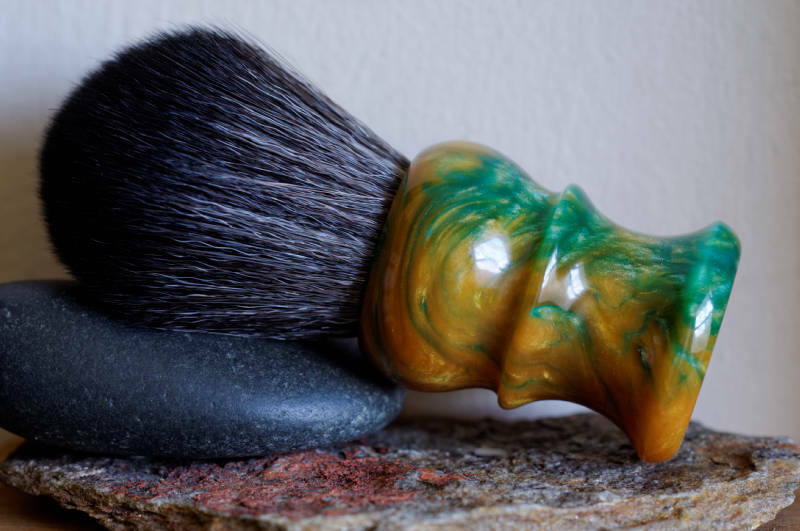 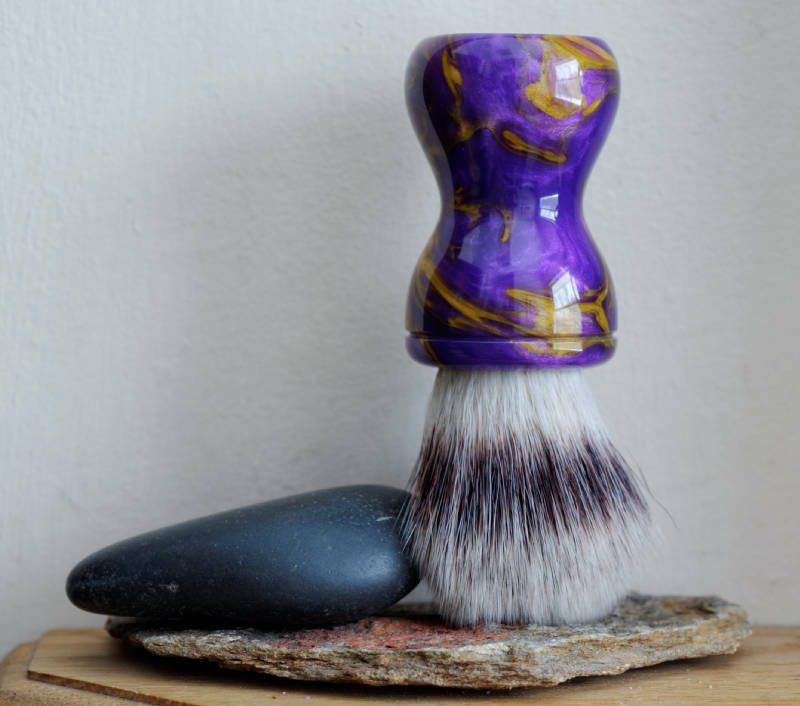 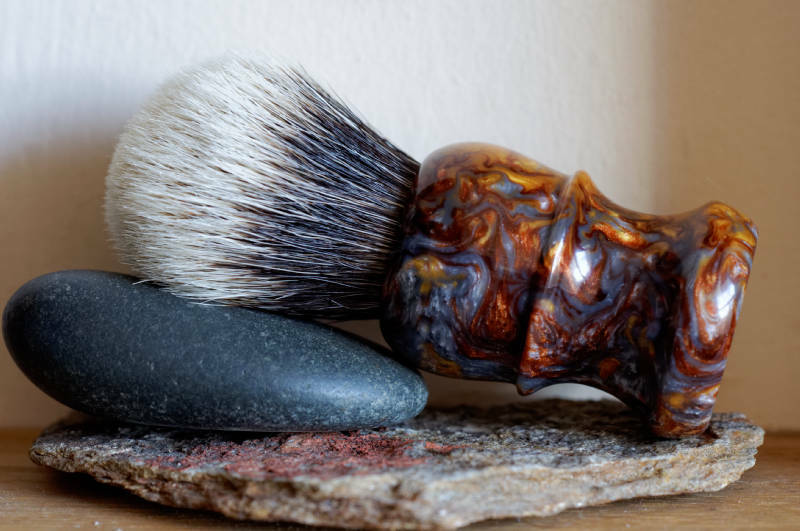 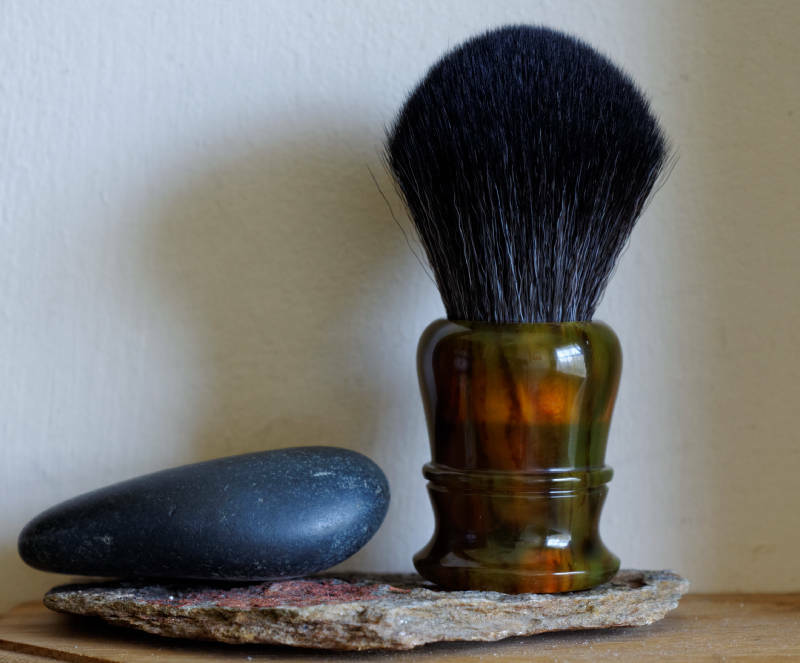 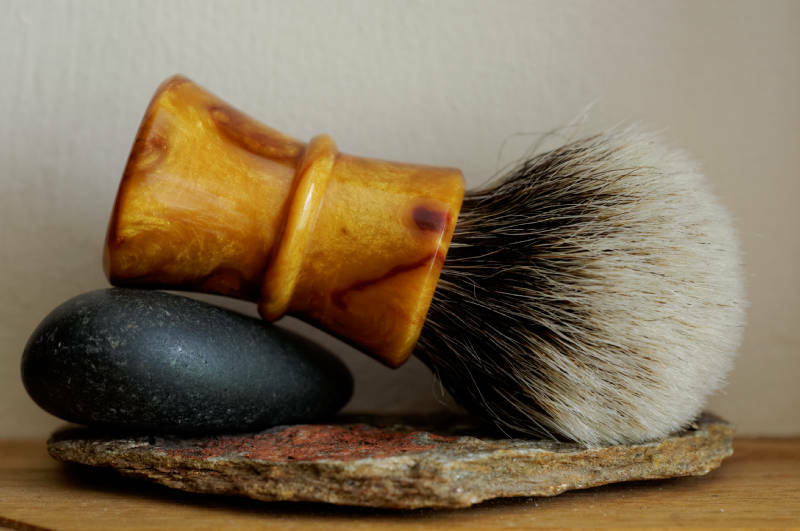 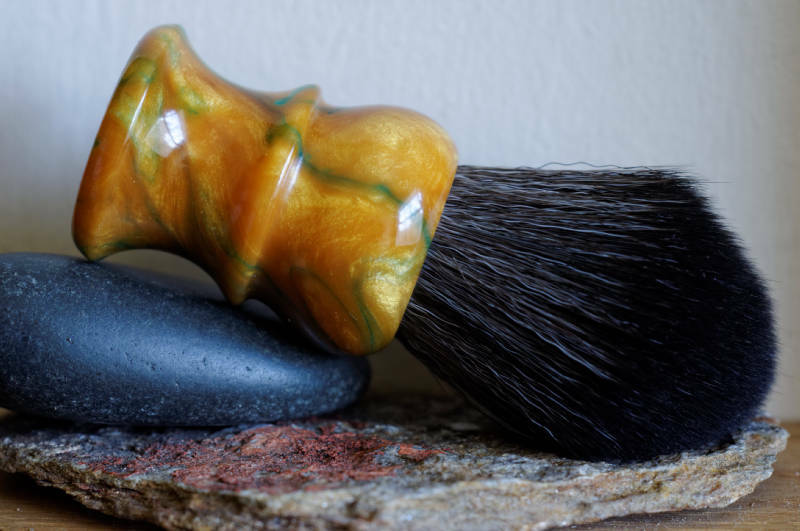 Second brush is made with Faux Tortoise Shell resin and TGN synthetic knot. 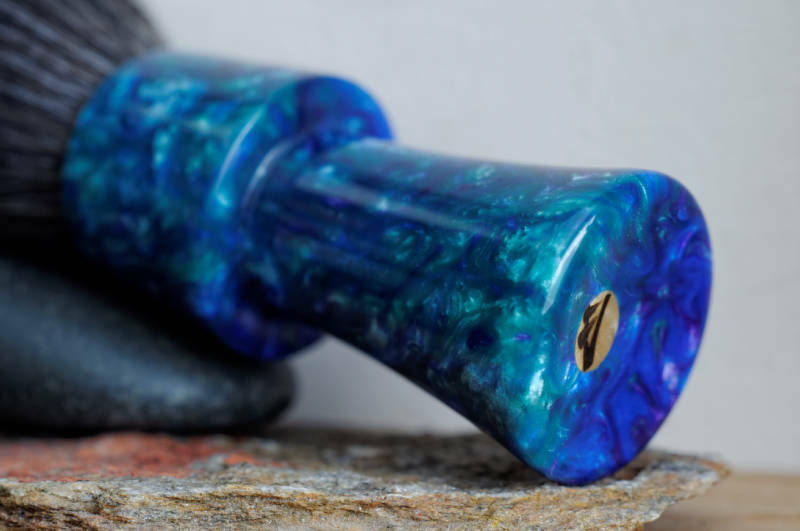 I have had a lot of custom work lately. 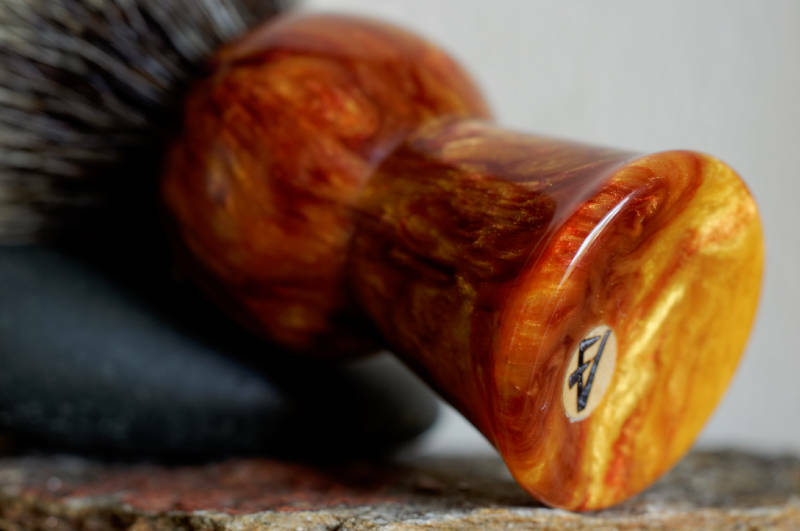 Here is the next one. 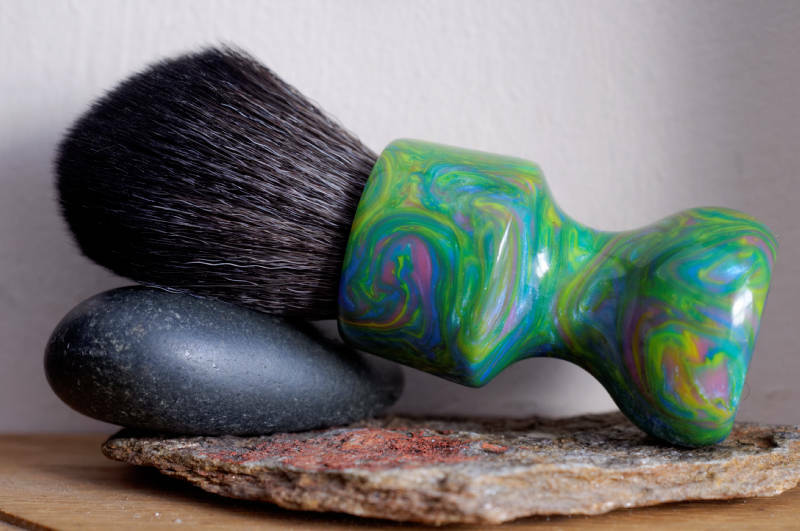 Pastel Dream resin handle and Black Onyx Soft Synthetic (BOSS) knot. 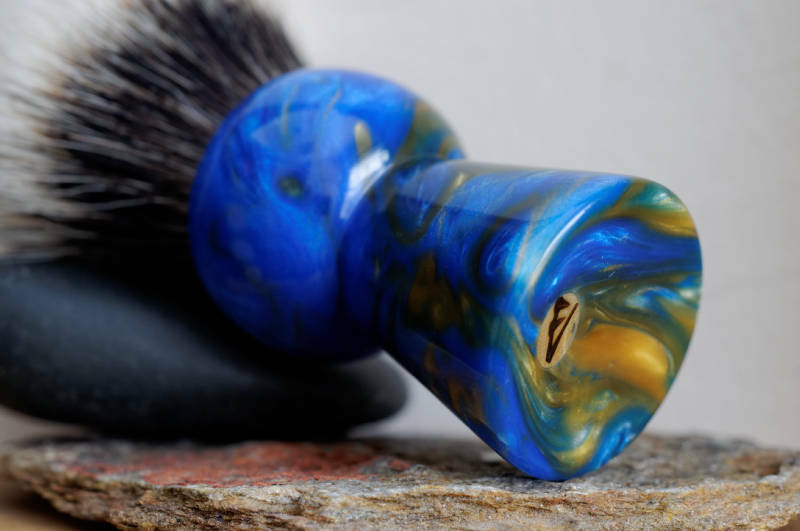 Next one is a Keythole Blue and Gold handle with two band finest knot. 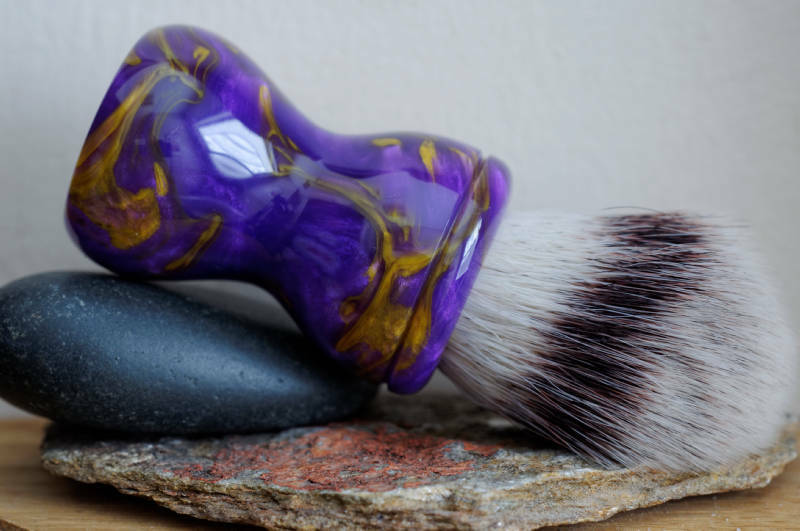 This one is in Elegance resin handle and three band synthetic from TGN. 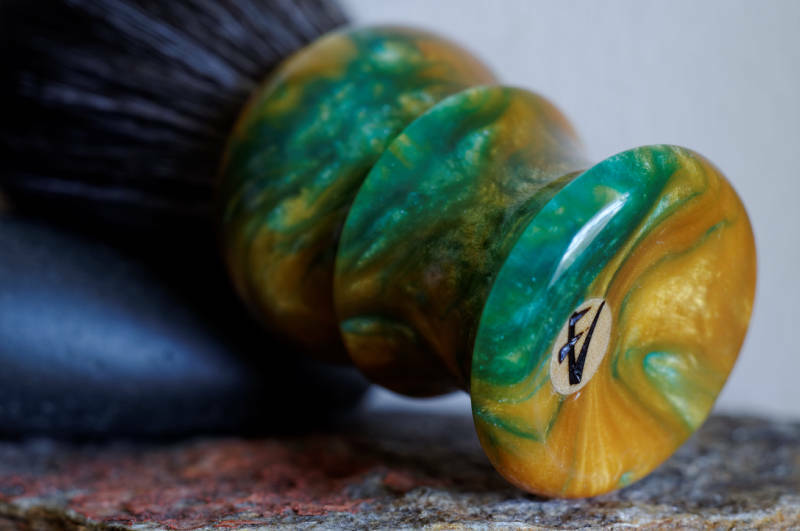 This is a Peacock resin with the BOSS knot. 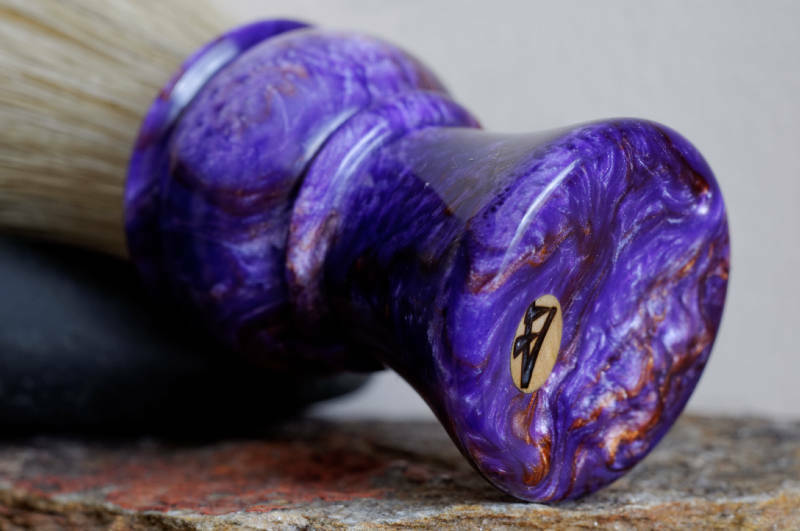 This one is in Bronze and Violet resin with the Omega 49 Pro knot. 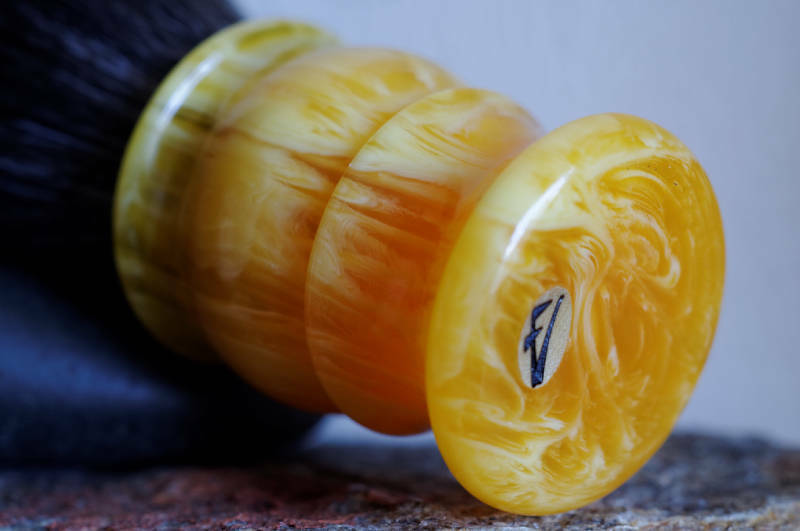 This is a hybrid of resin and wood. 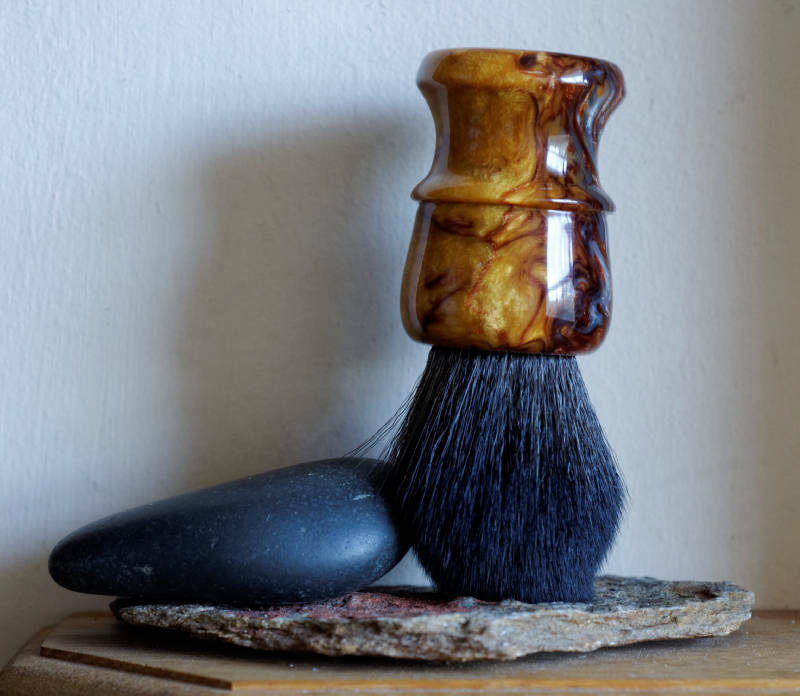 Faux Ivory resin and Cocobolo wood. 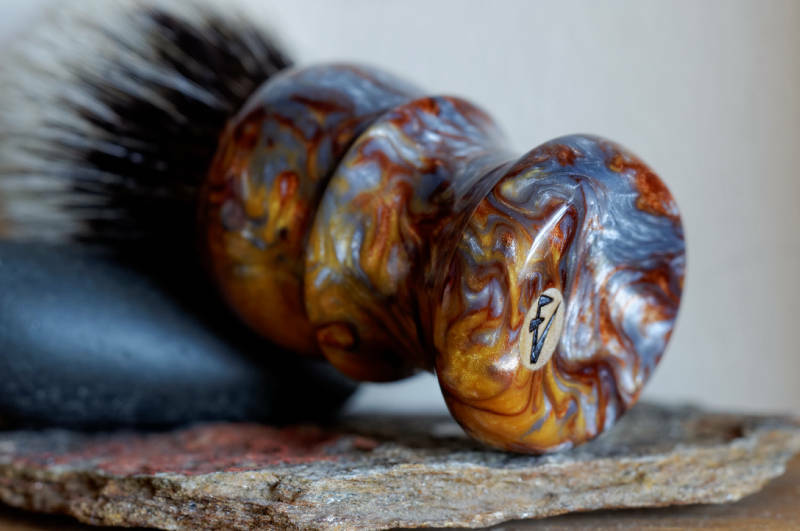 Two band finest badger knot.